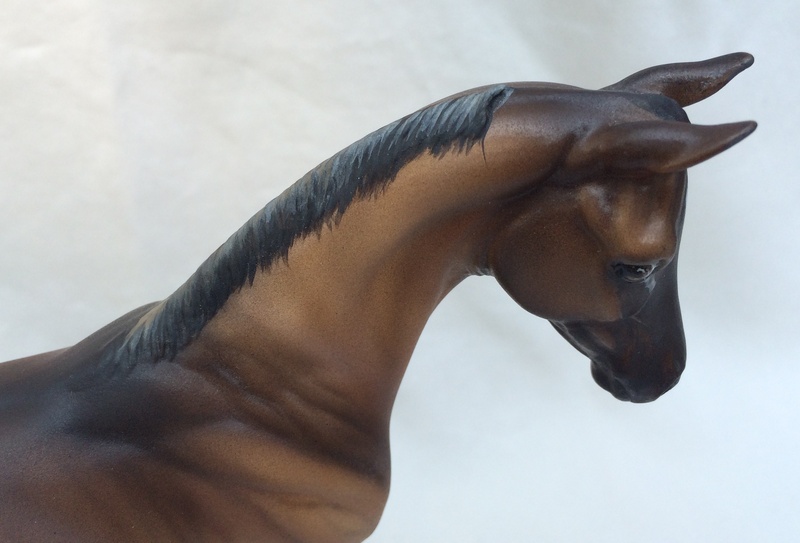 These horses from my personal collection are currently for sale. 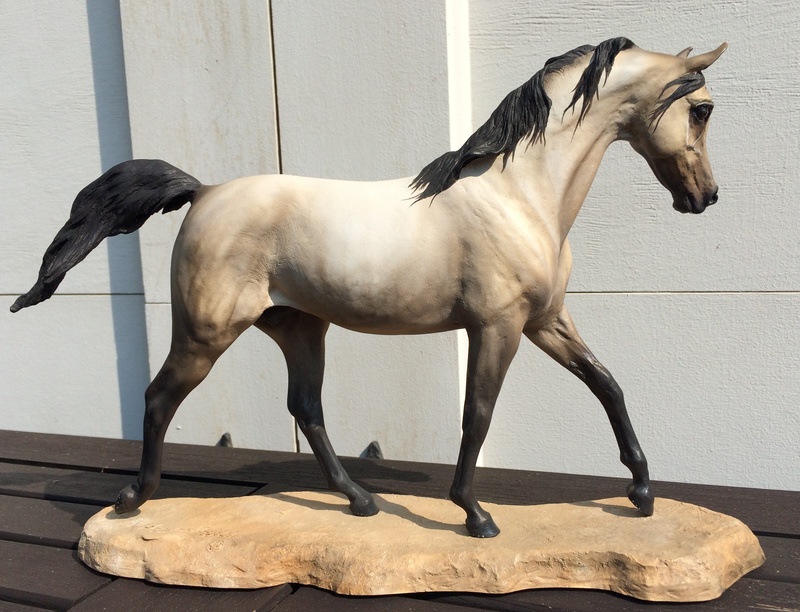 Please email me at jamie@sackcorp.com with any questions or offers. 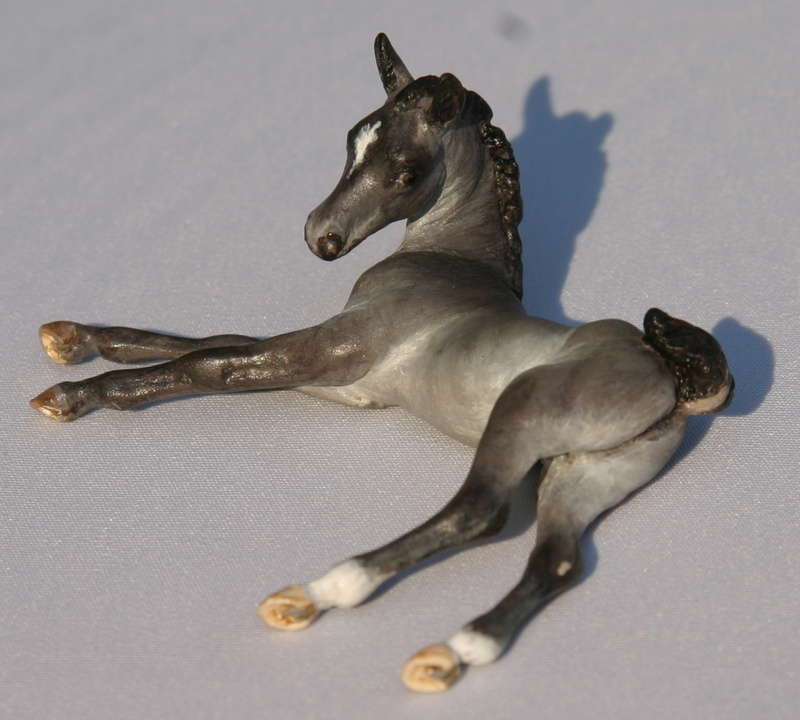 I receive a lot of spam, so putting Resin Sale in the subject line would greatly help your email to catch my attention. 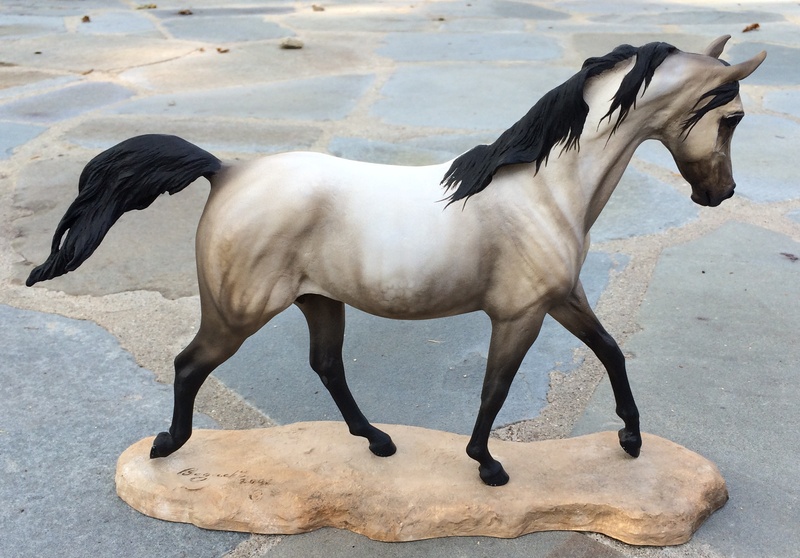 :) I apologize for dust on the horses - email me if you have questions about a specific horse and I may be able to send you more pictures. 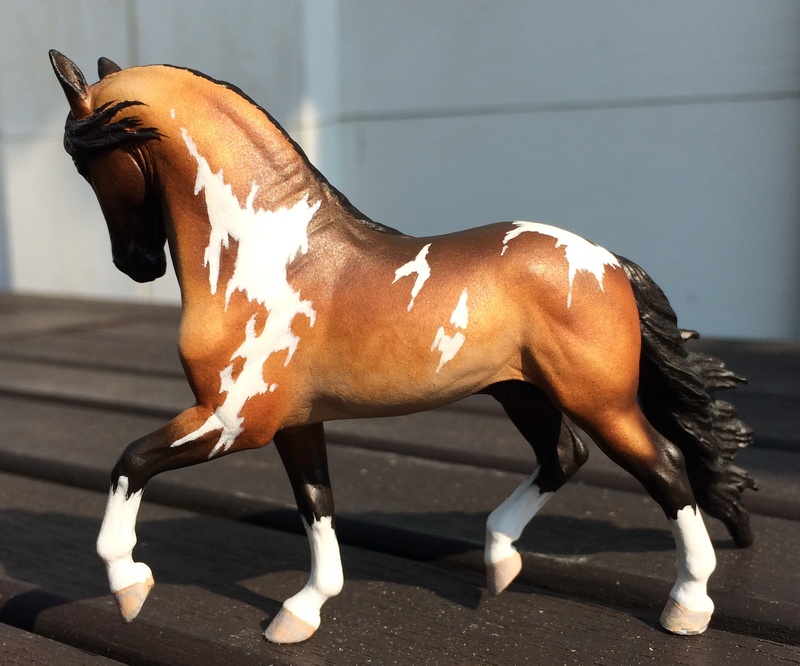 I have not been active in the hobby for several years now, so I really didn't know what to set for pricing. 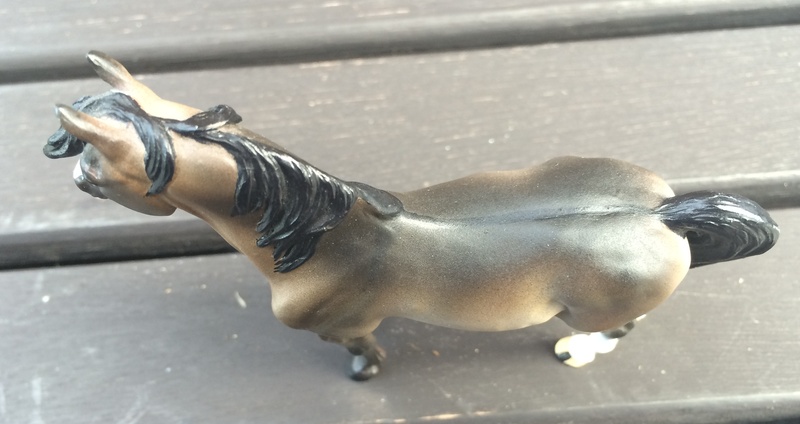 I would like to be fair to both sides. 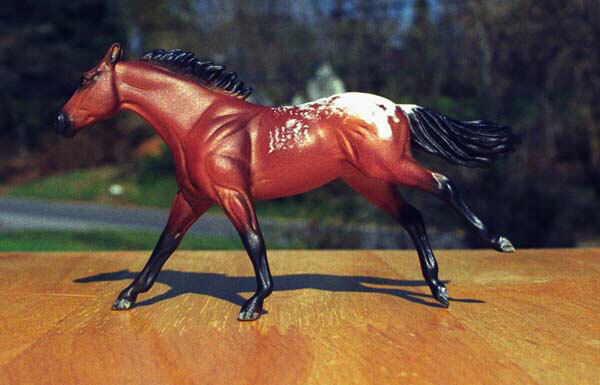 I've scattered a few prices in where I had records of what I paid, but they could have gone up or down in value since then. 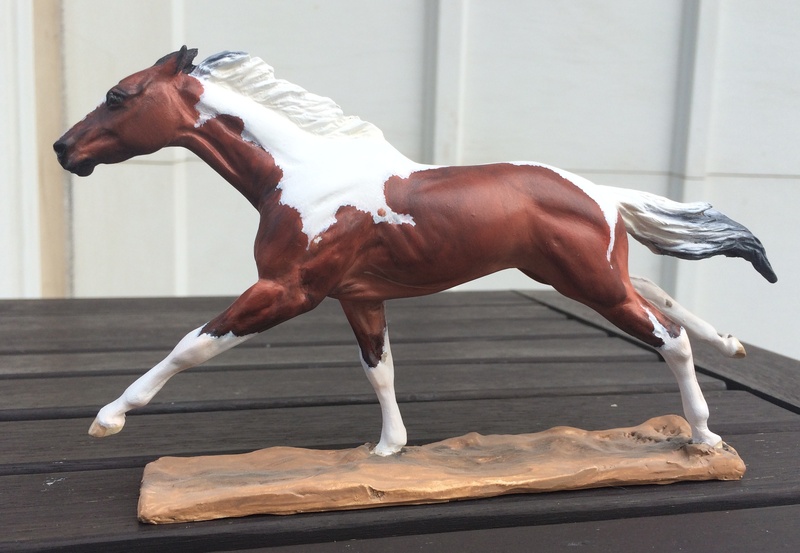 Please make me an offer and I'll compare it with any others I may receive. 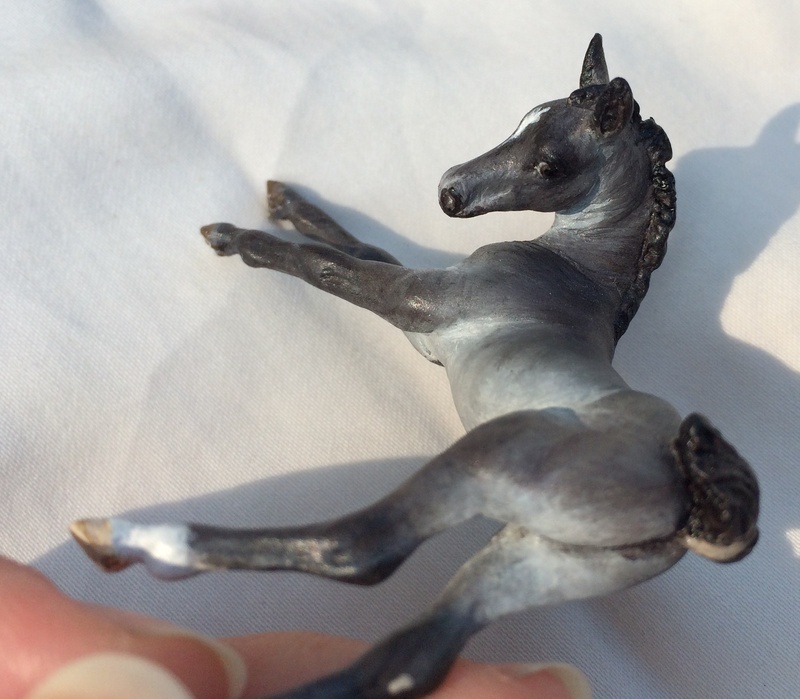 Payment - I can accept Paypal and U.S. 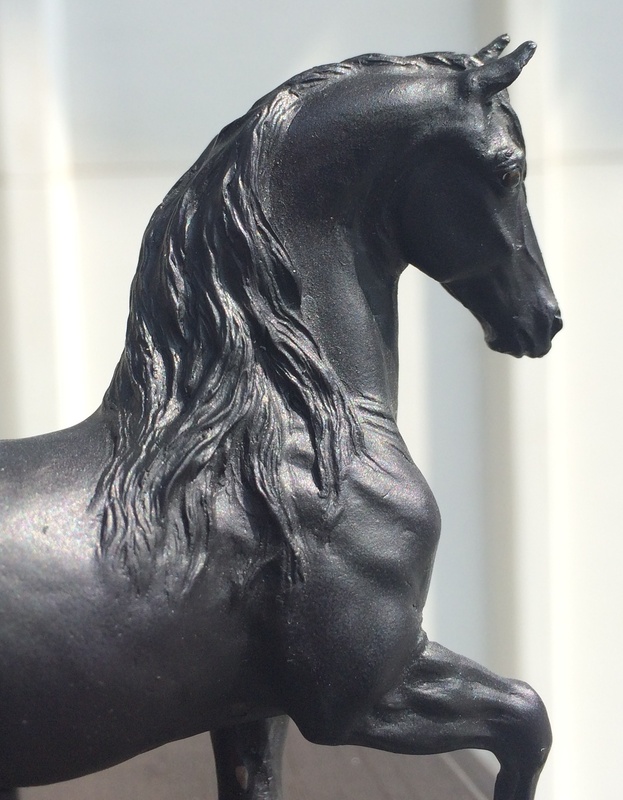 Postal Service money orders. 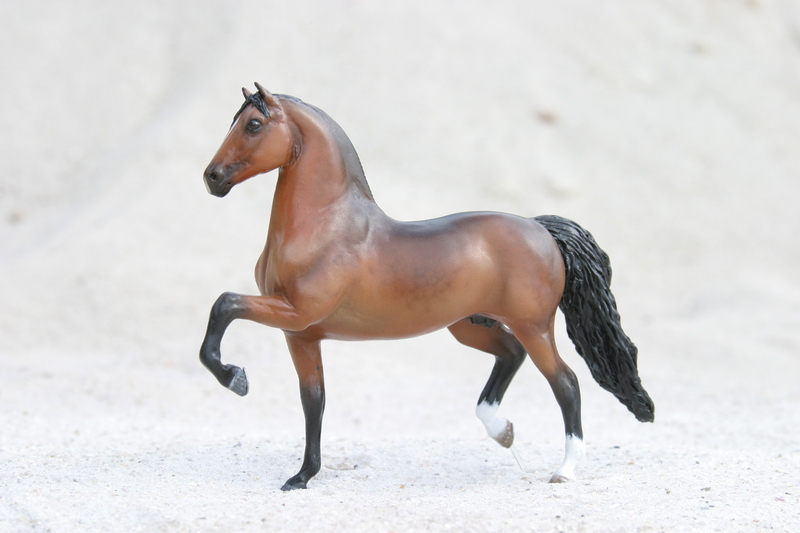 Personal checks and time payments I may consider on a case-by-case basis, but preference would be given to those paying by other methods. 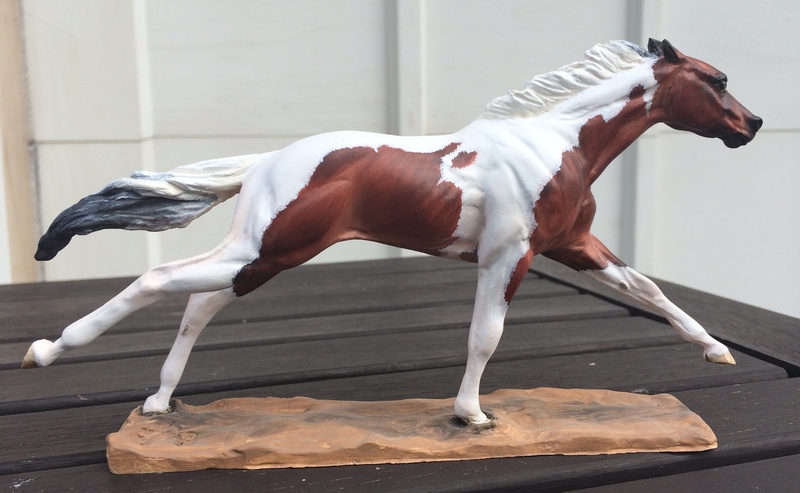 Buyer is to pay shipping/ insurance charges. 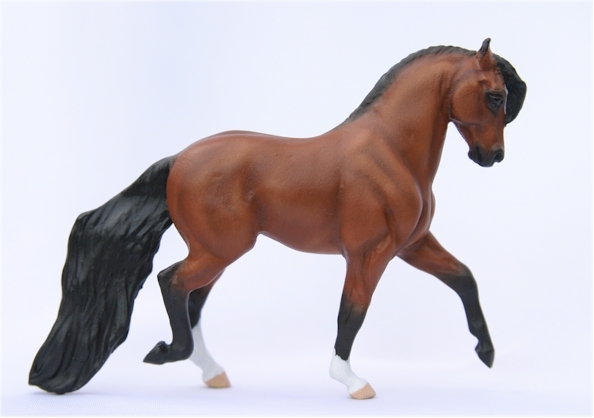 I haven't mailed horses in a while, so I am not sure what prices to expect, but I may be able to weigh the horse and box to get an estimate for you. 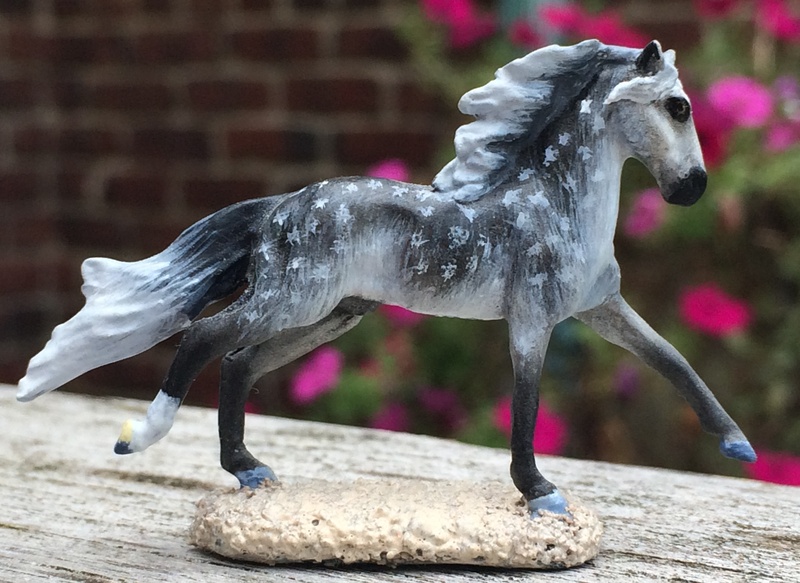 I fear that with listing all these at once I may run short of boxes and this could delay shipment a few days on some... but rest assured I will send them all to their new homes as soon as I possibly can! 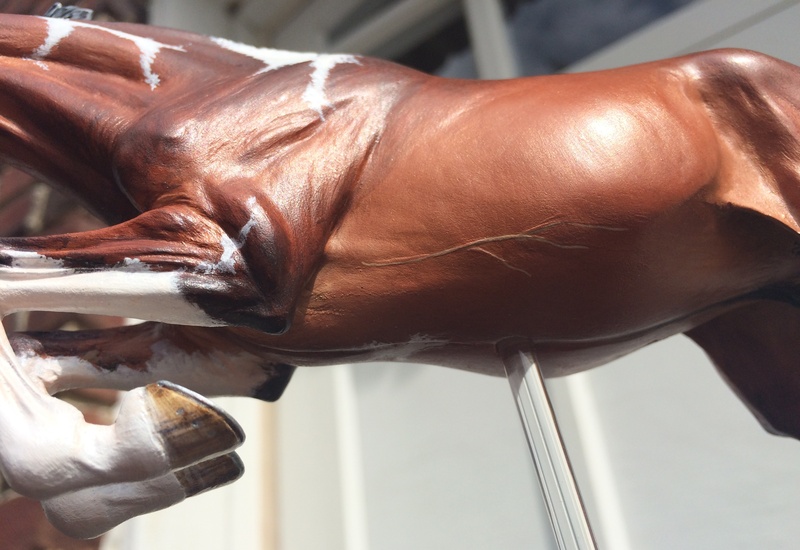 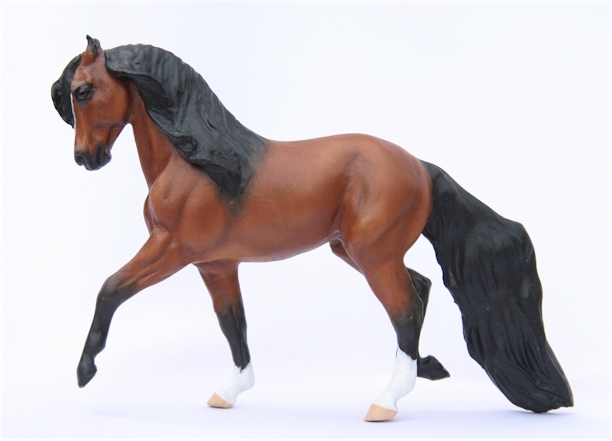 Horse was created with pegs in its feet to fit into its custom base, which has since been attached to a wooden base. 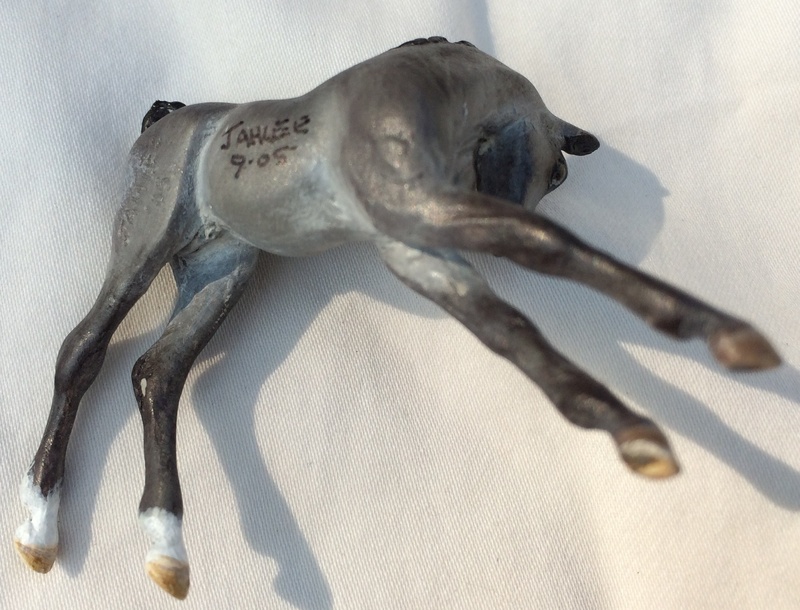 I also have Fraley's set of unpainted pictures, which I would be happy to send if they can be of help. 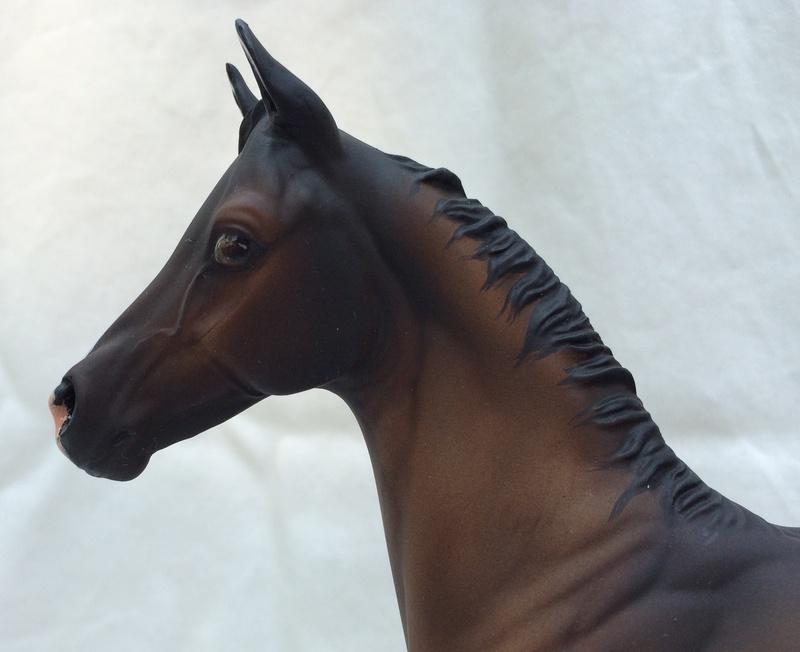 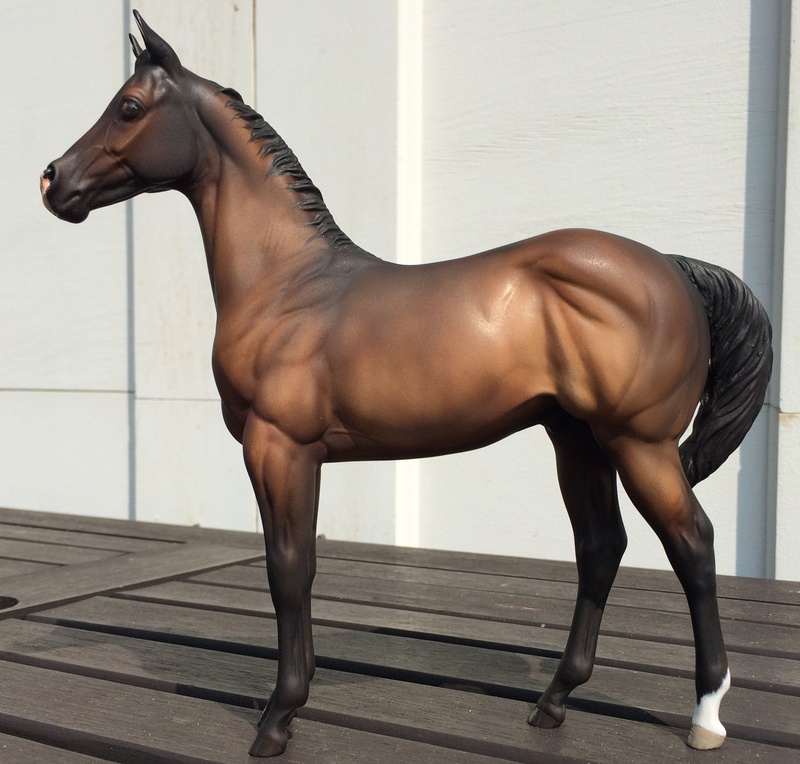 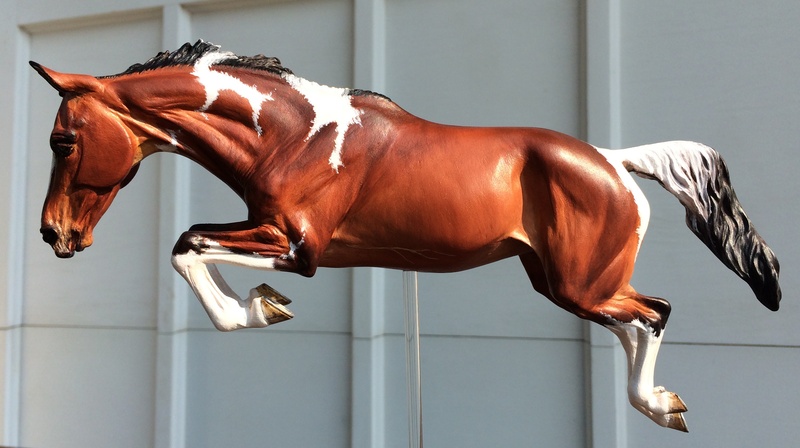 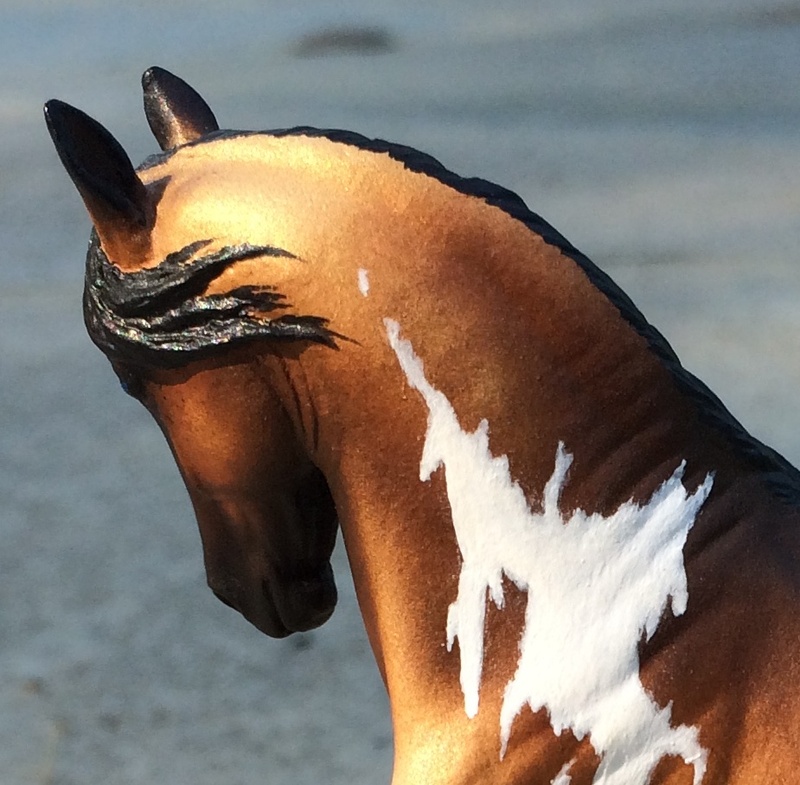 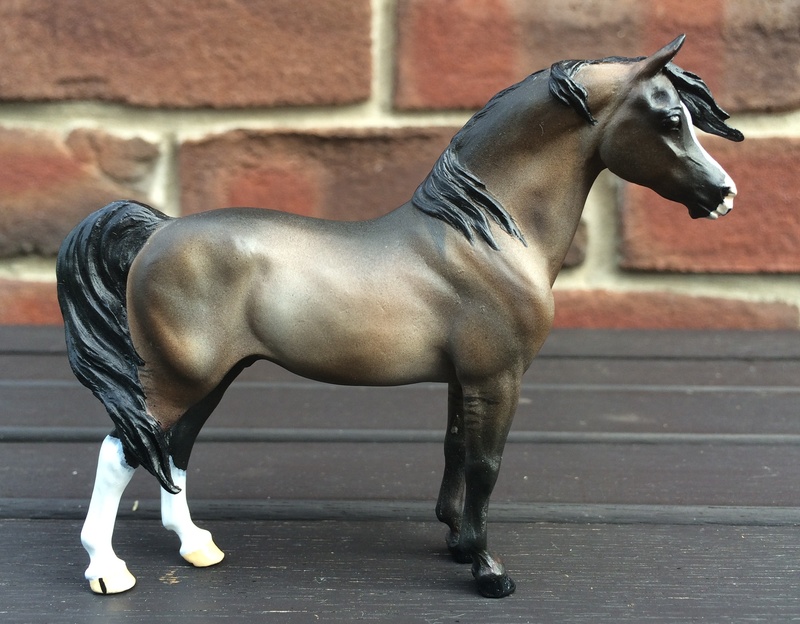 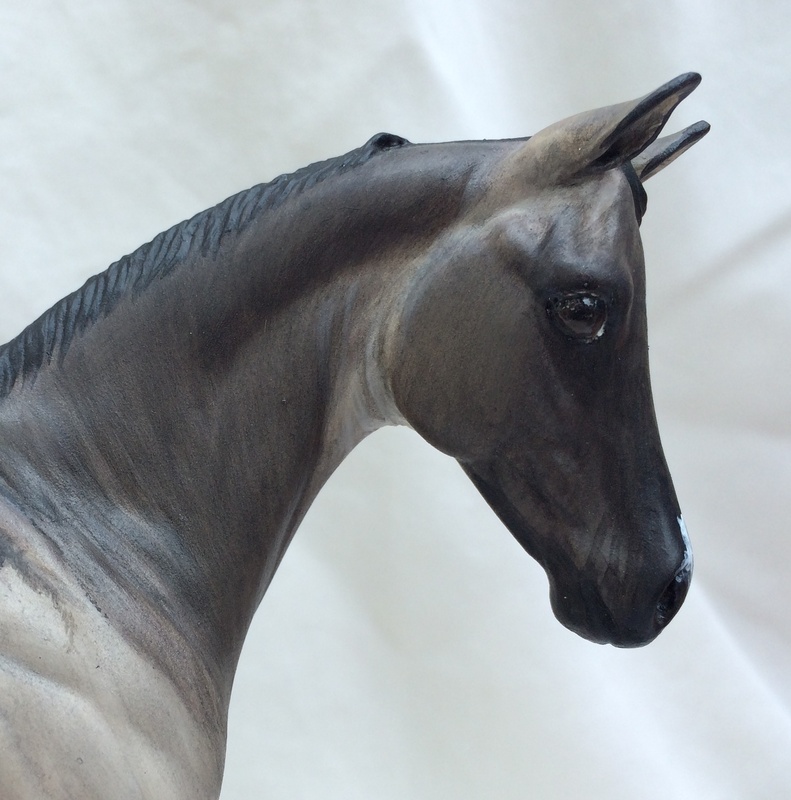 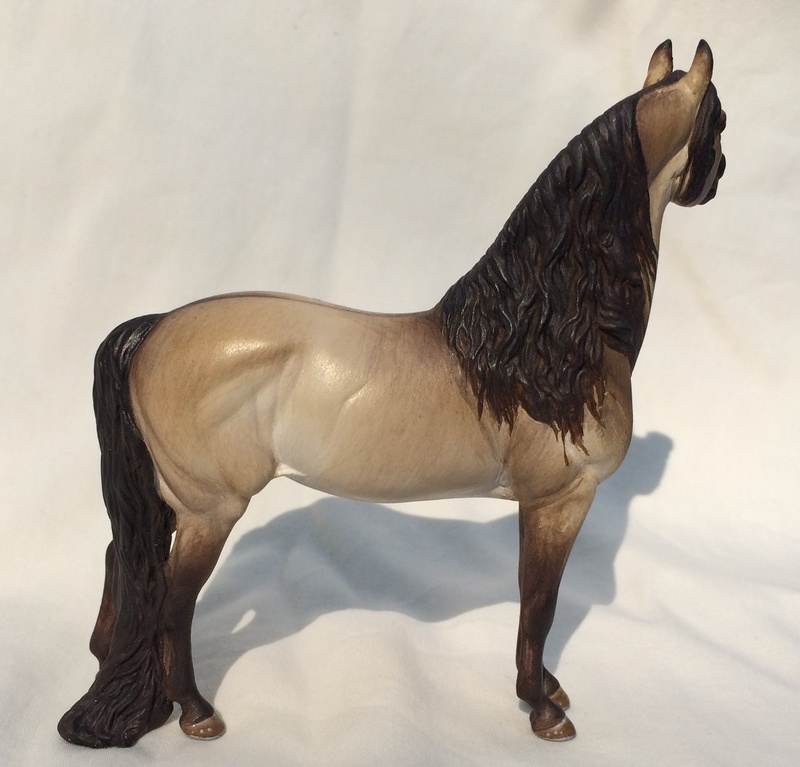 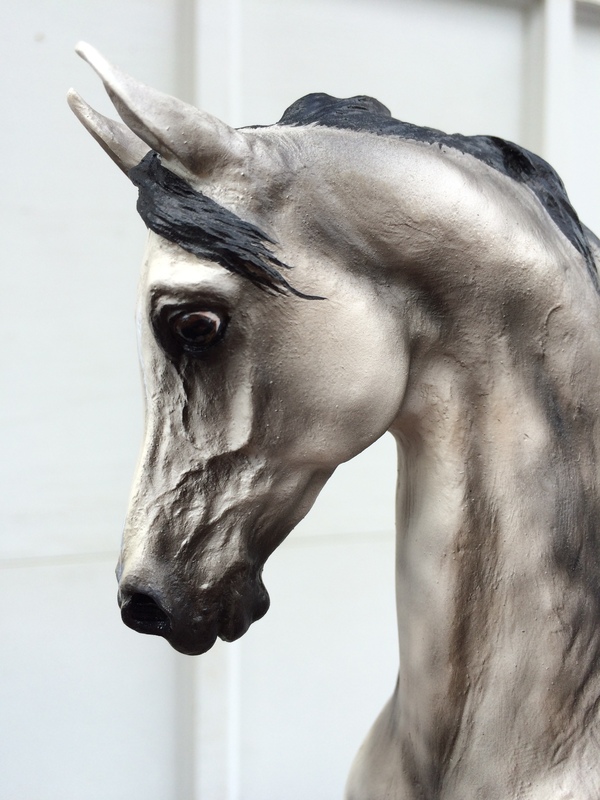 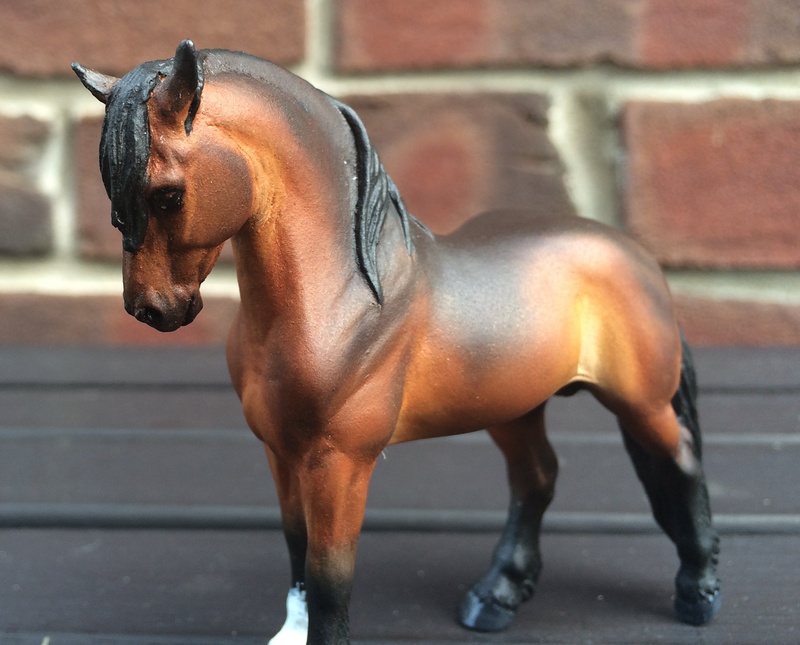 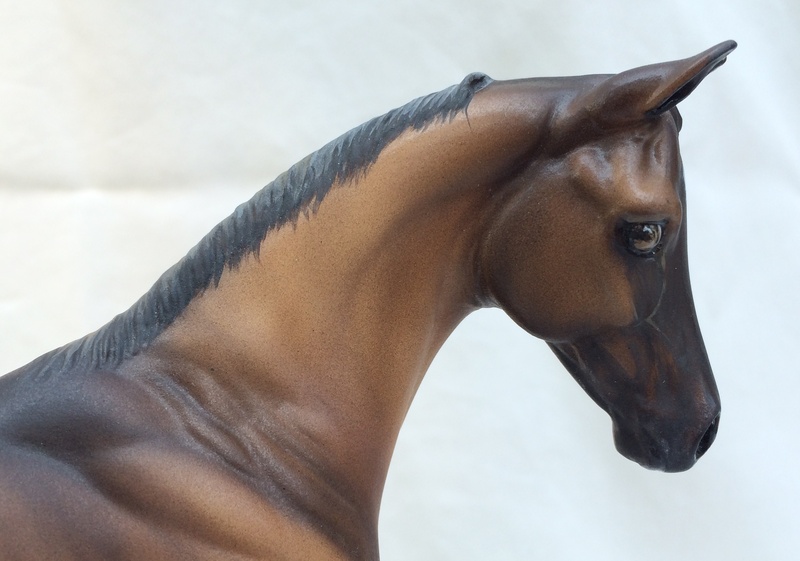 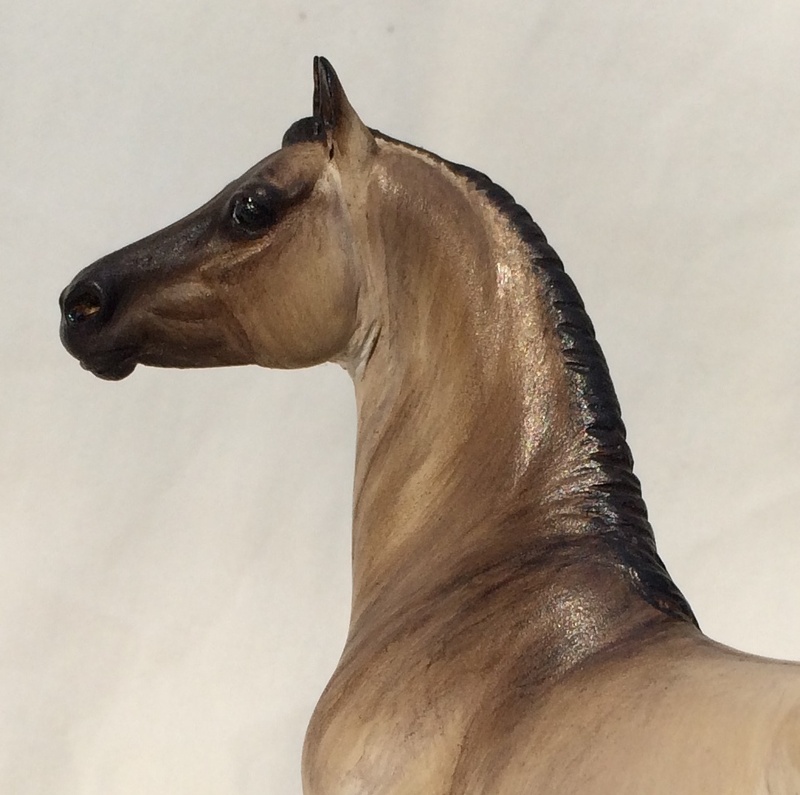 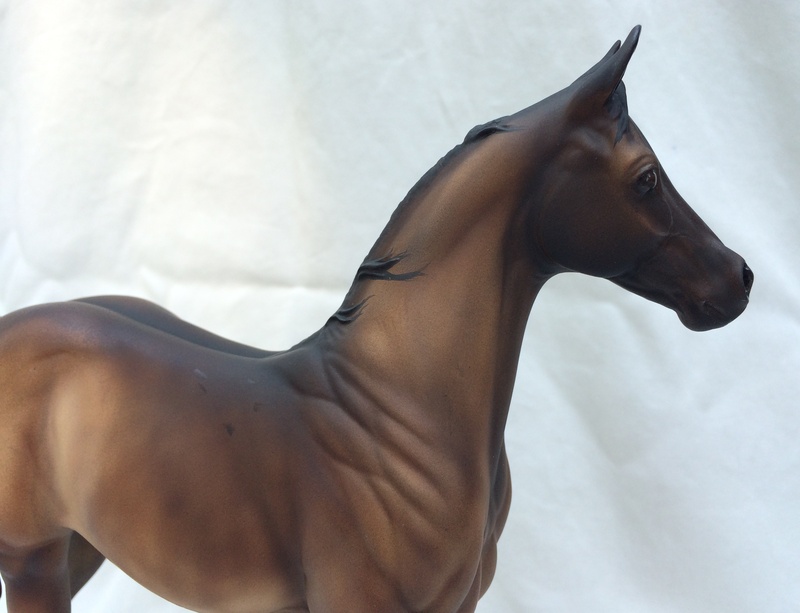 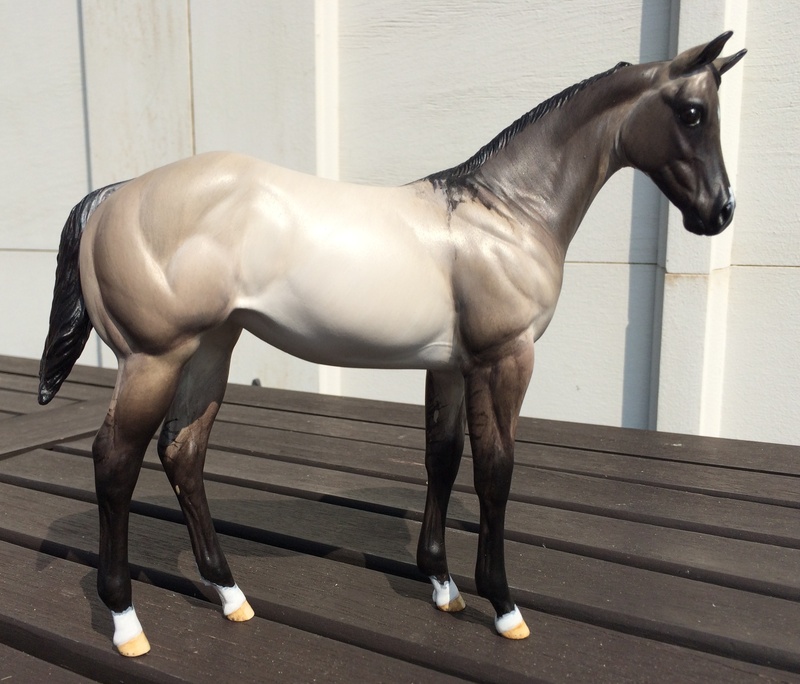 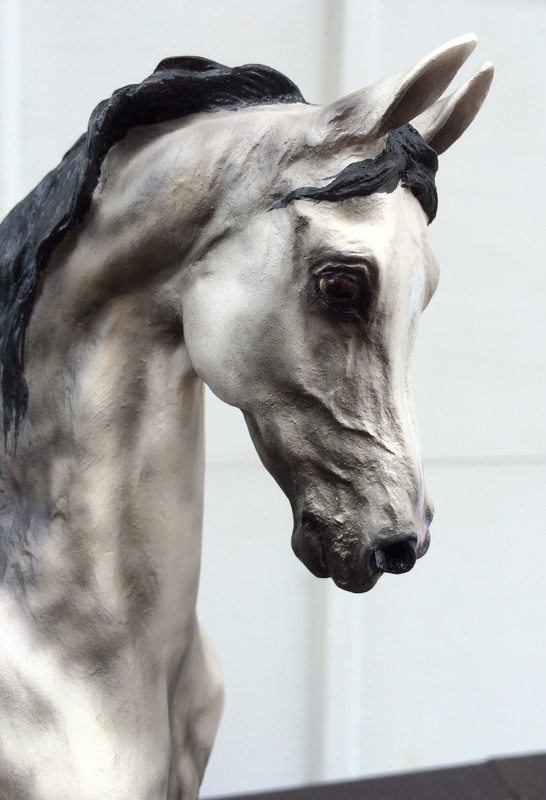 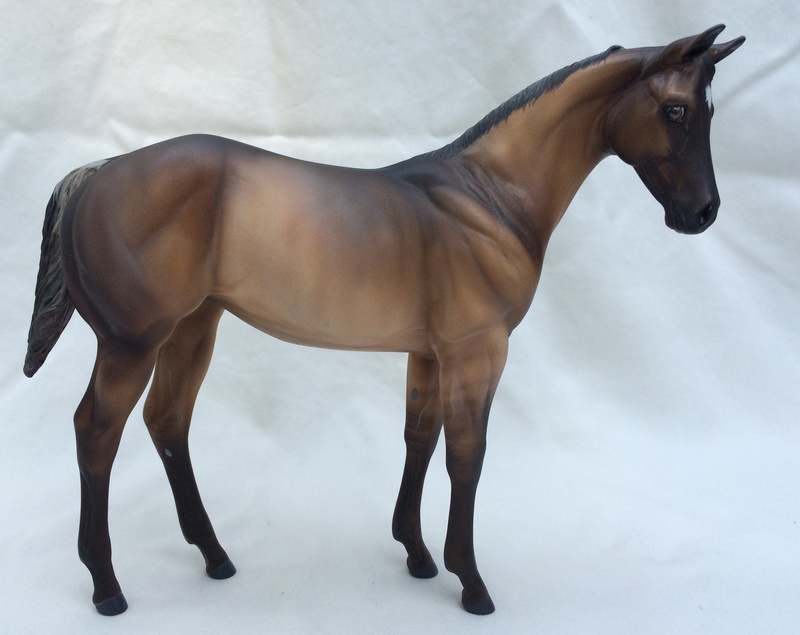 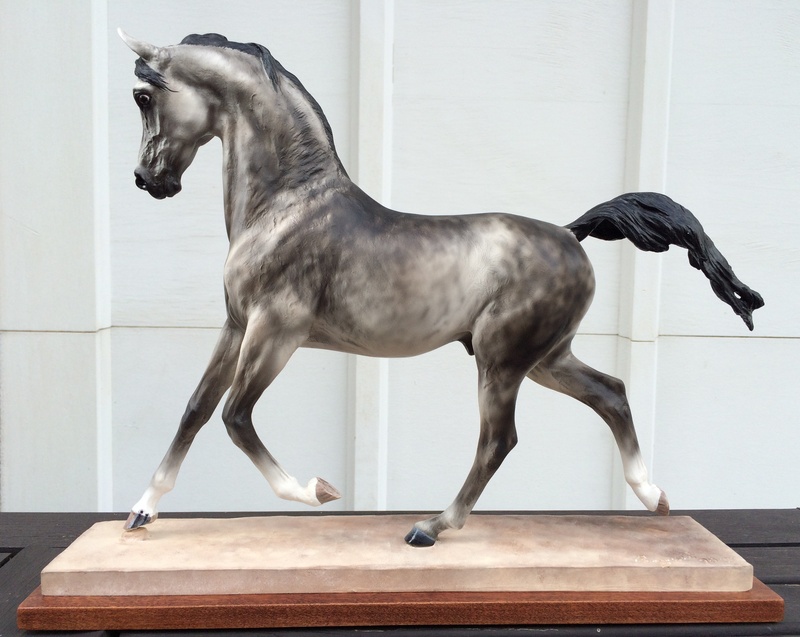 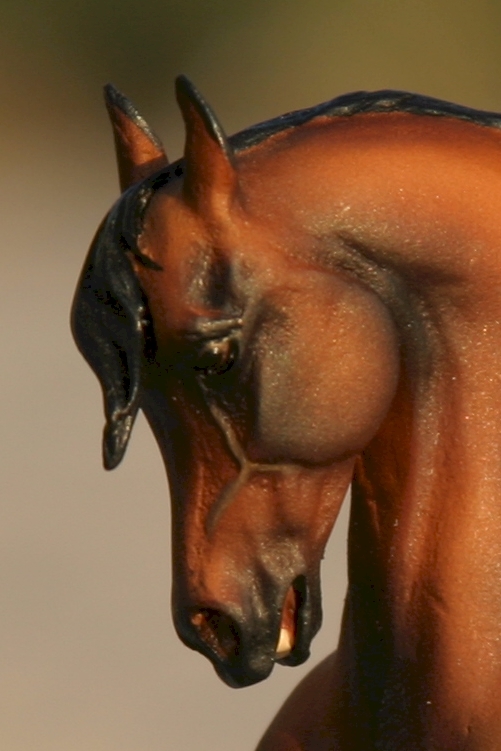 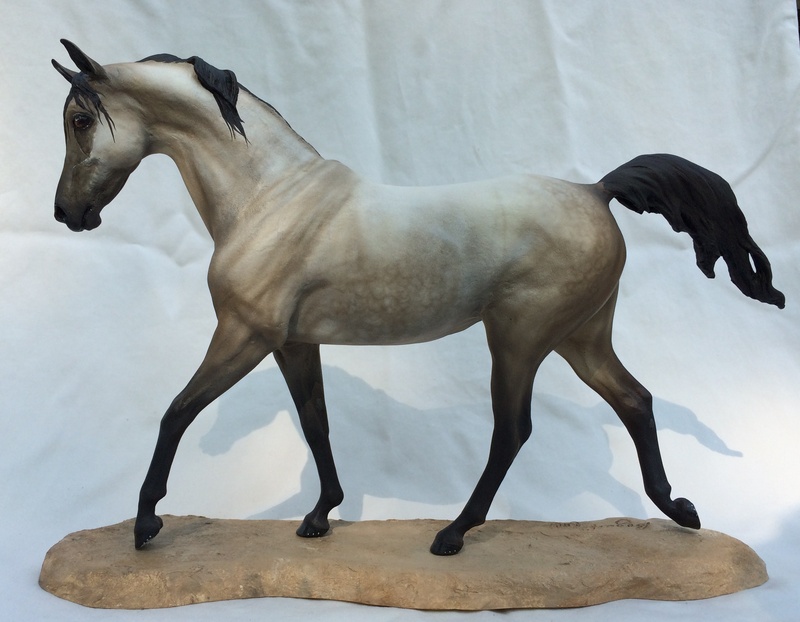 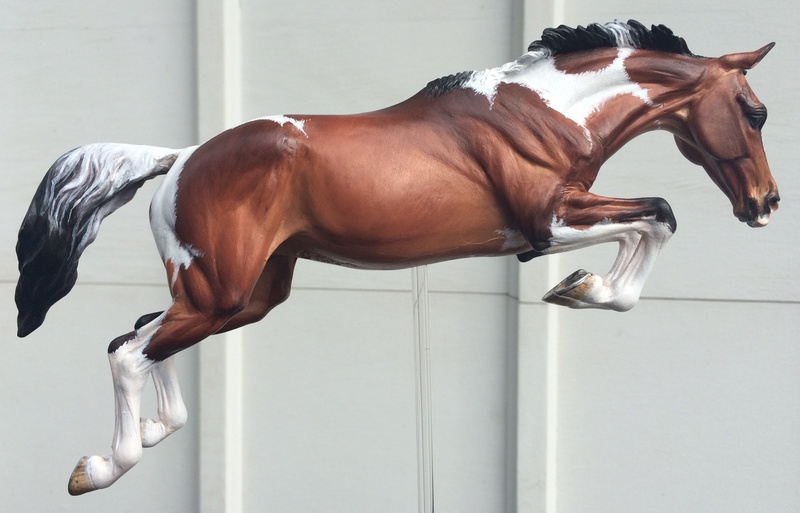 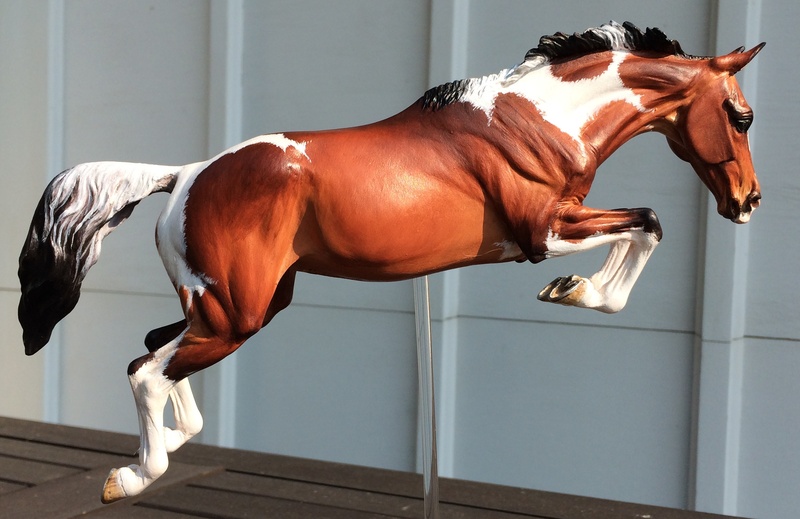 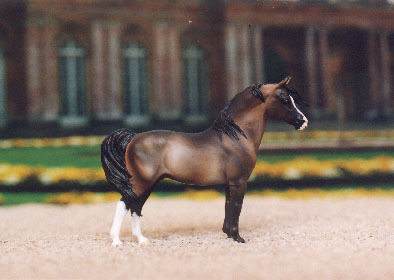 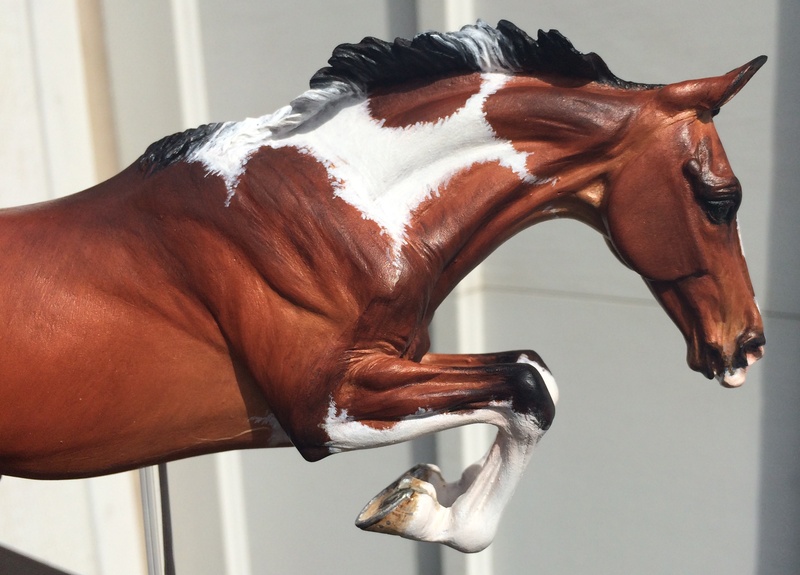 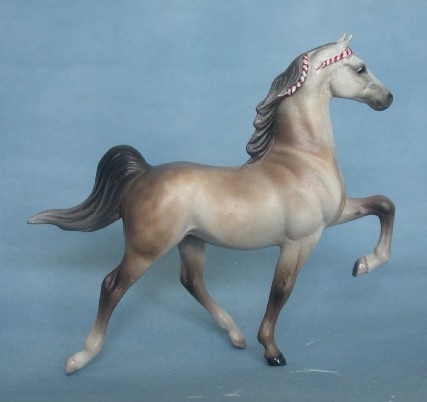 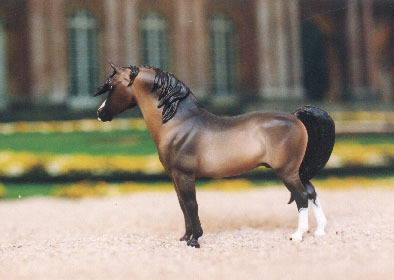 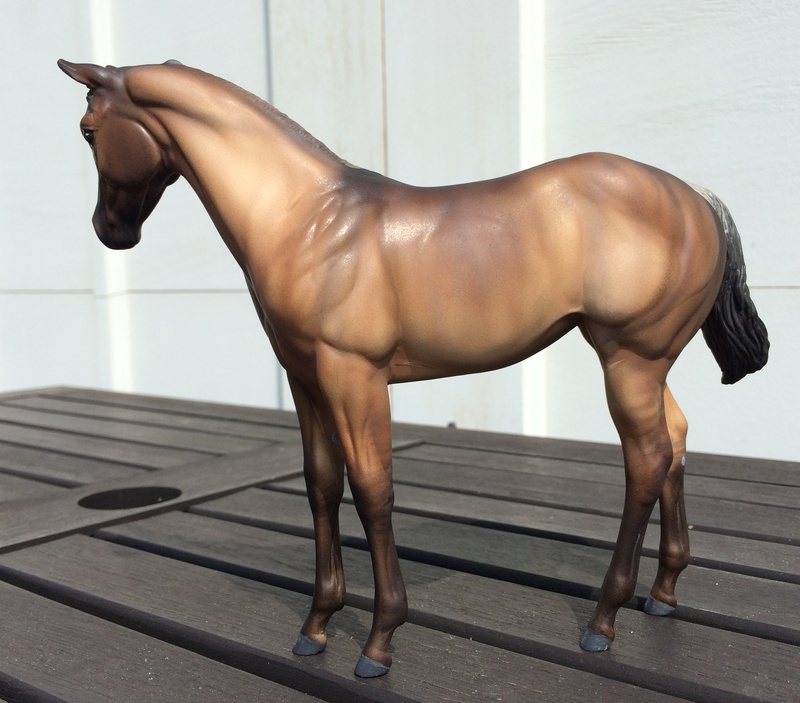 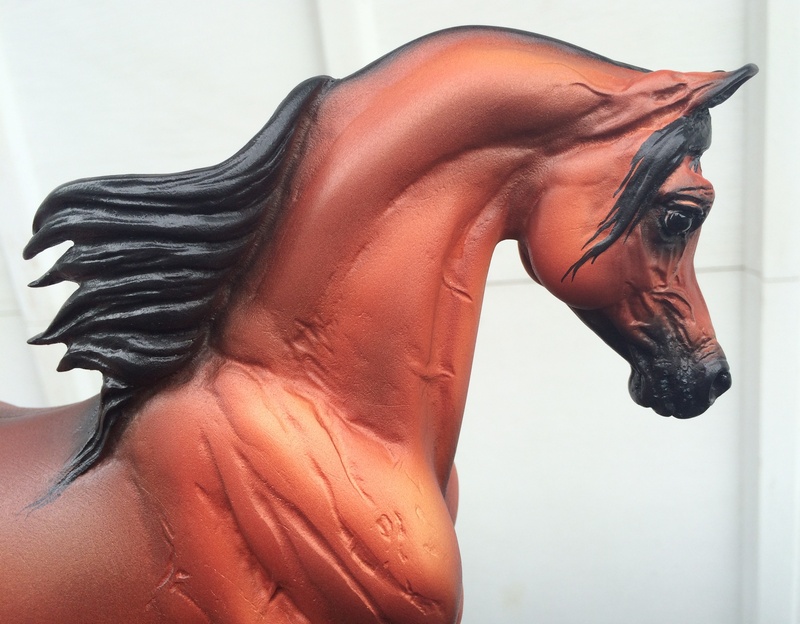 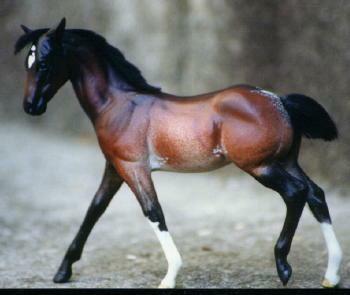 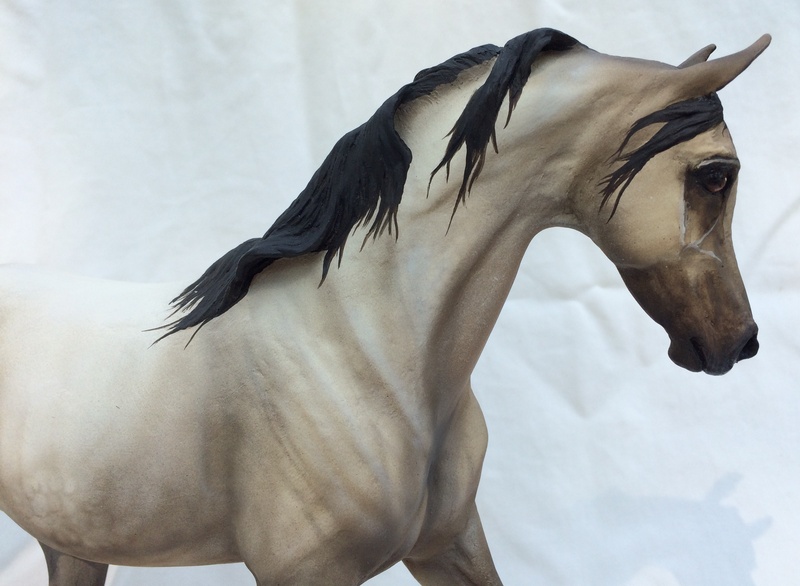 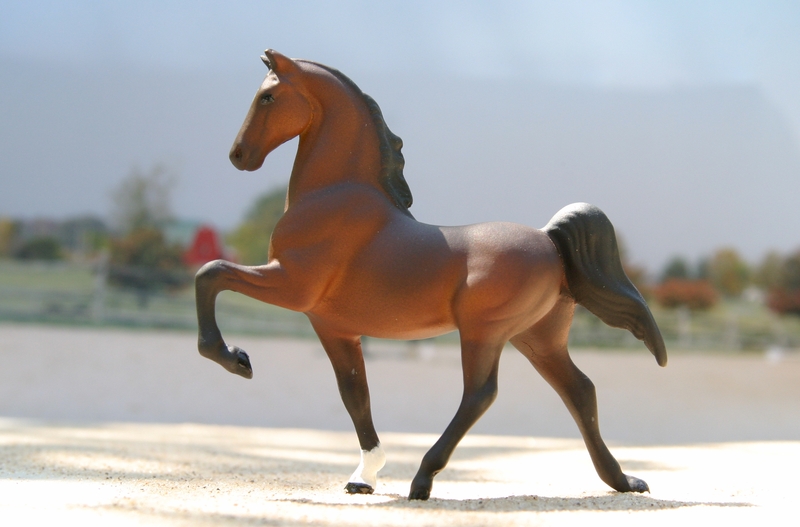 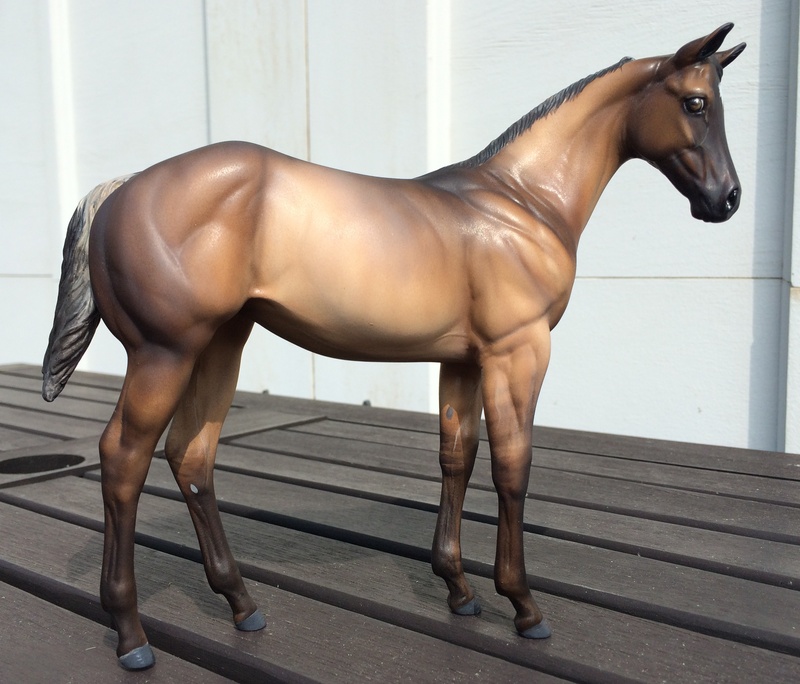 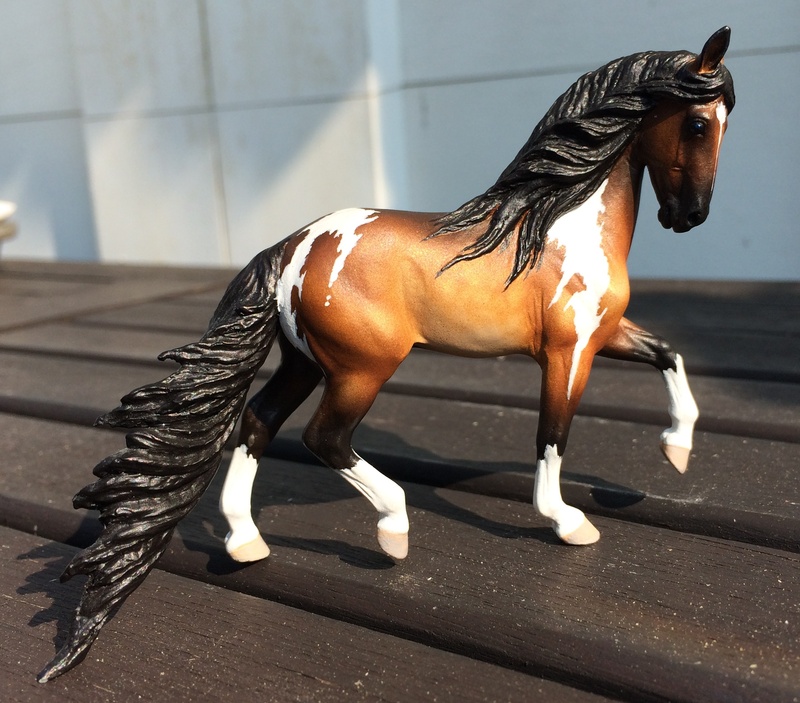 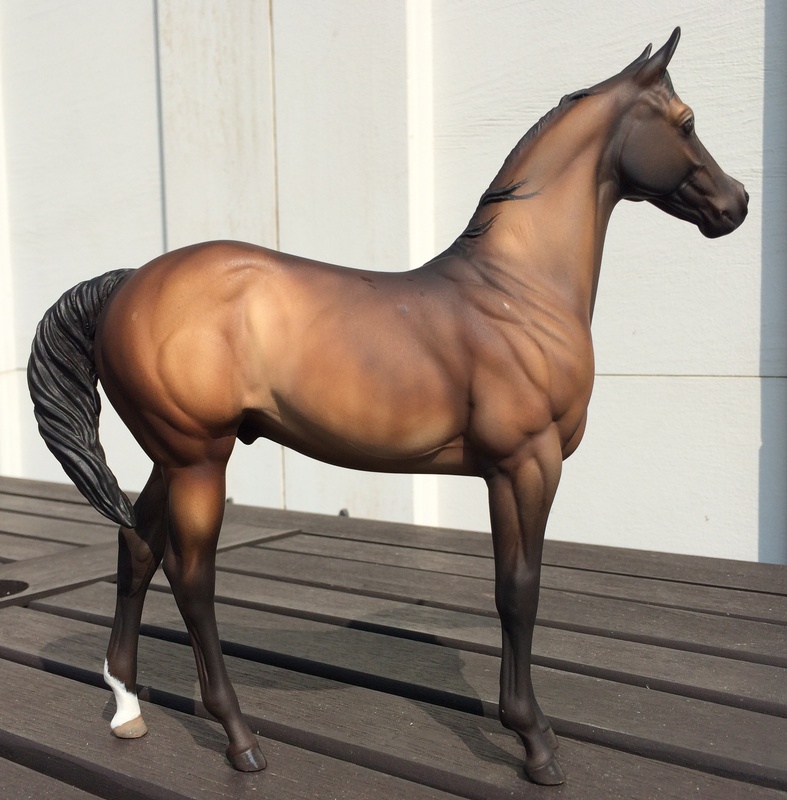 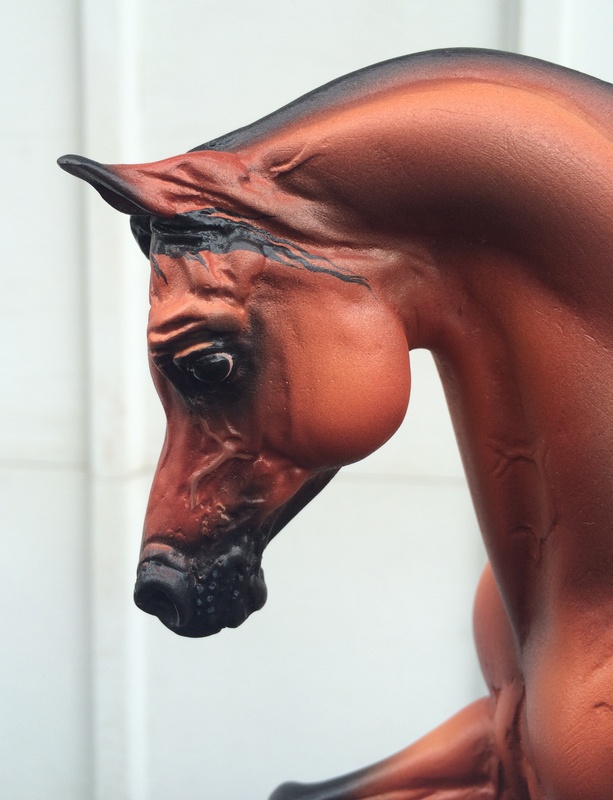 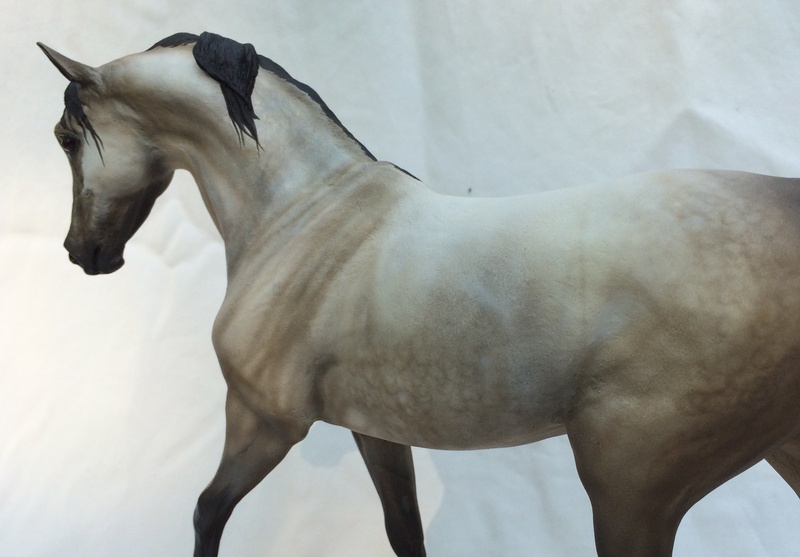 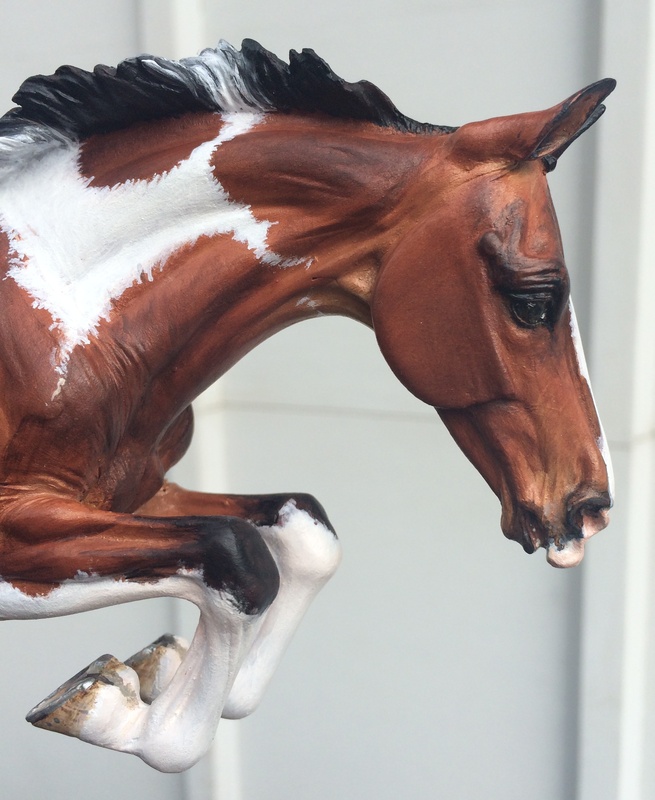 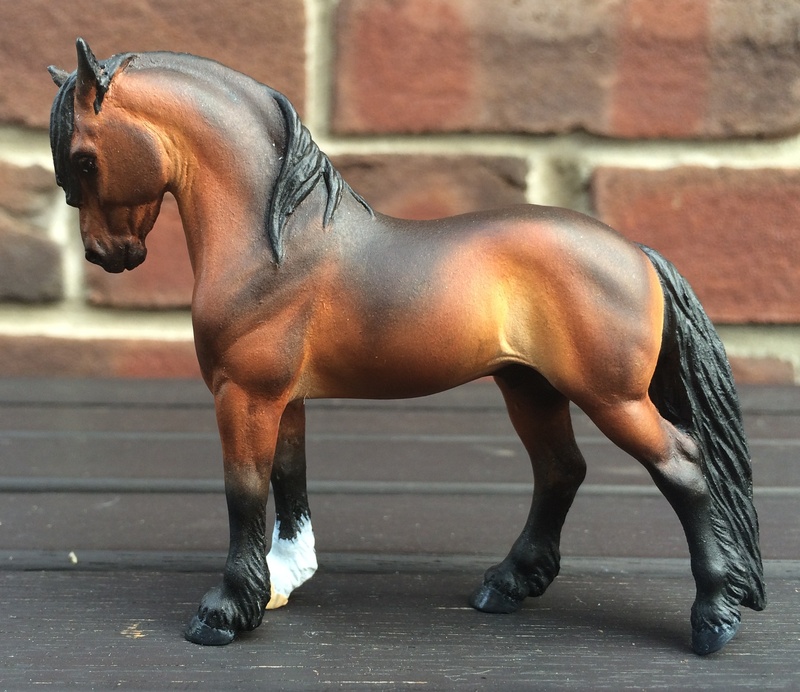 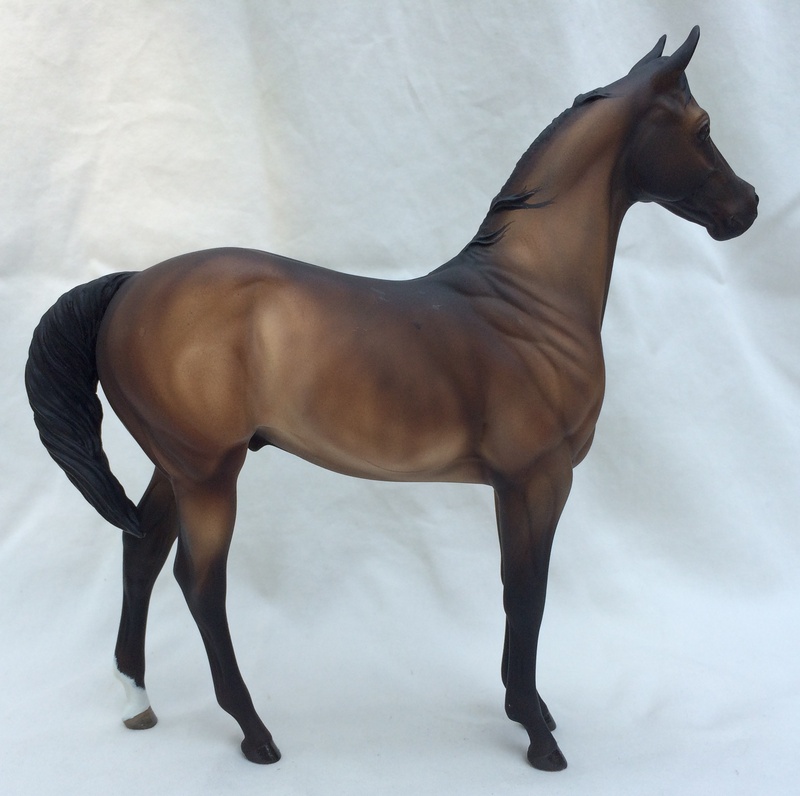 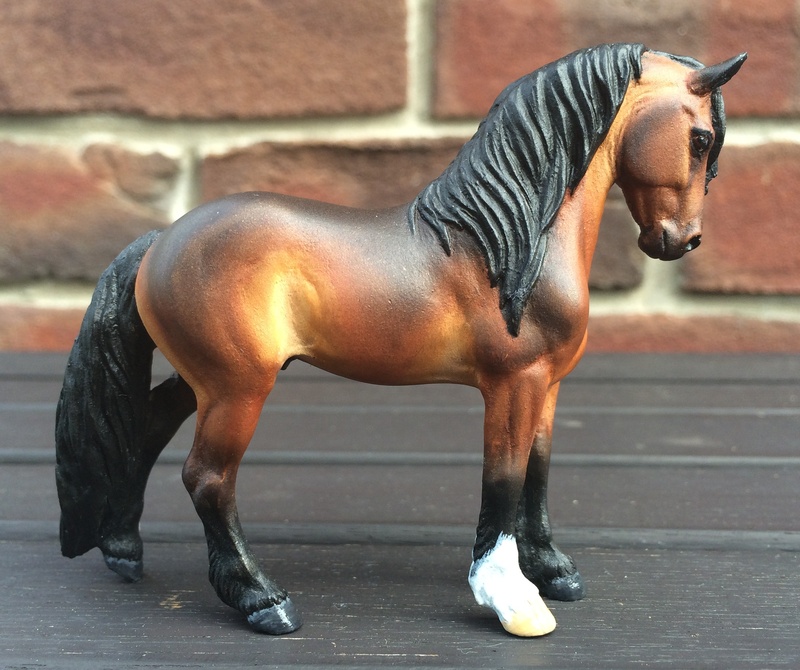 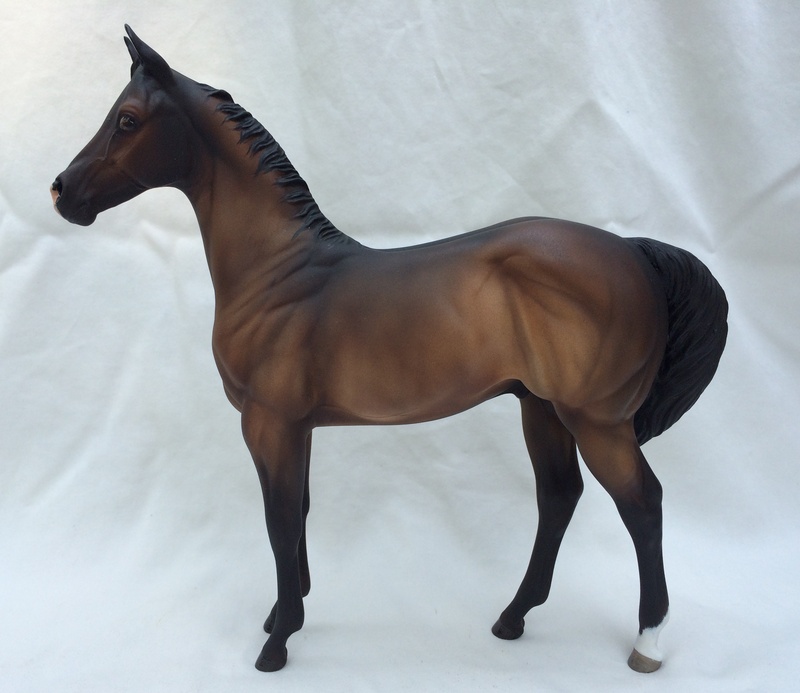 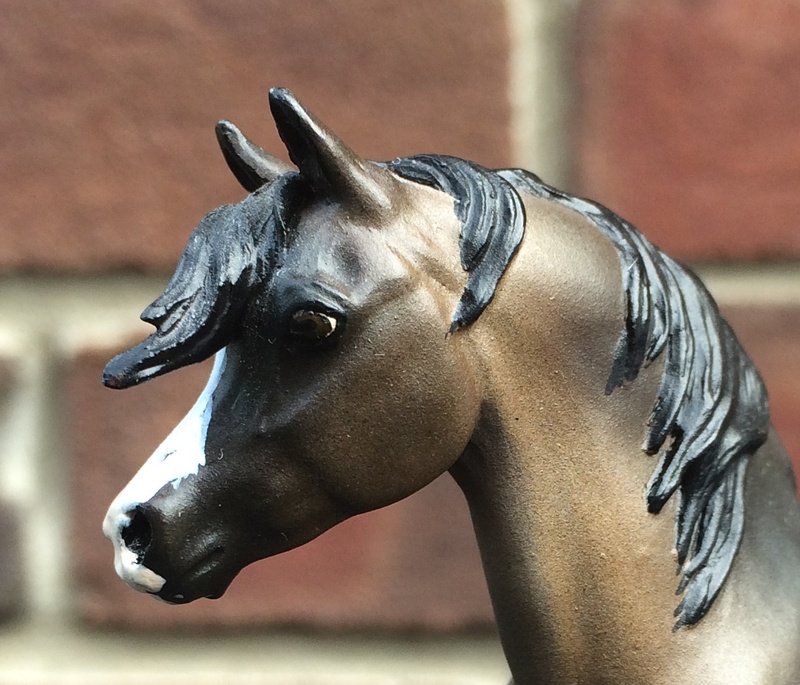 Johara is a traditional-scale Arabian mare sculpted by the Boguckis. 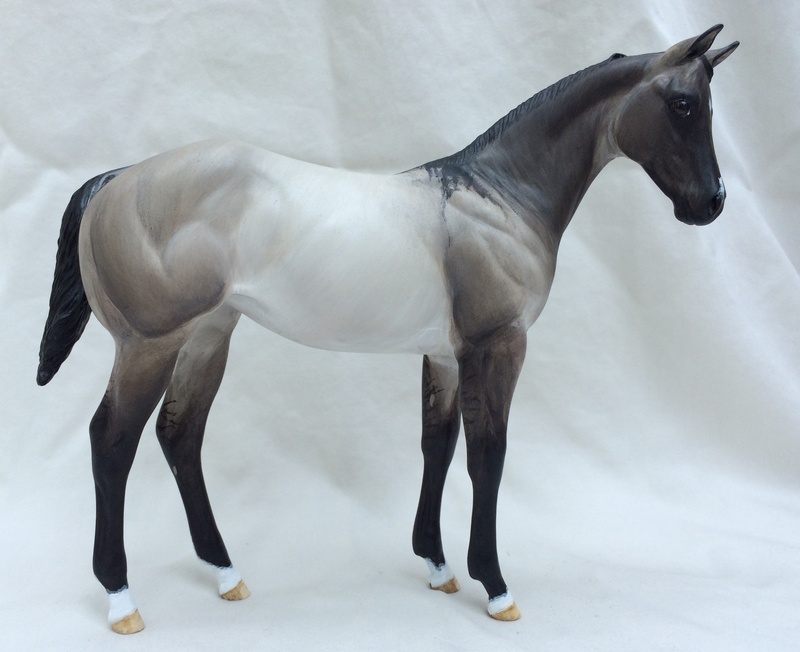 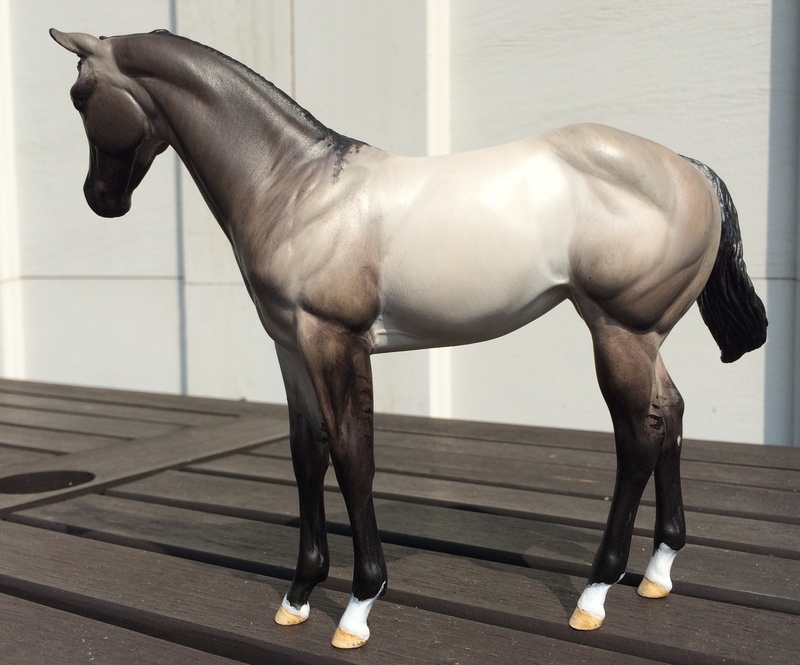 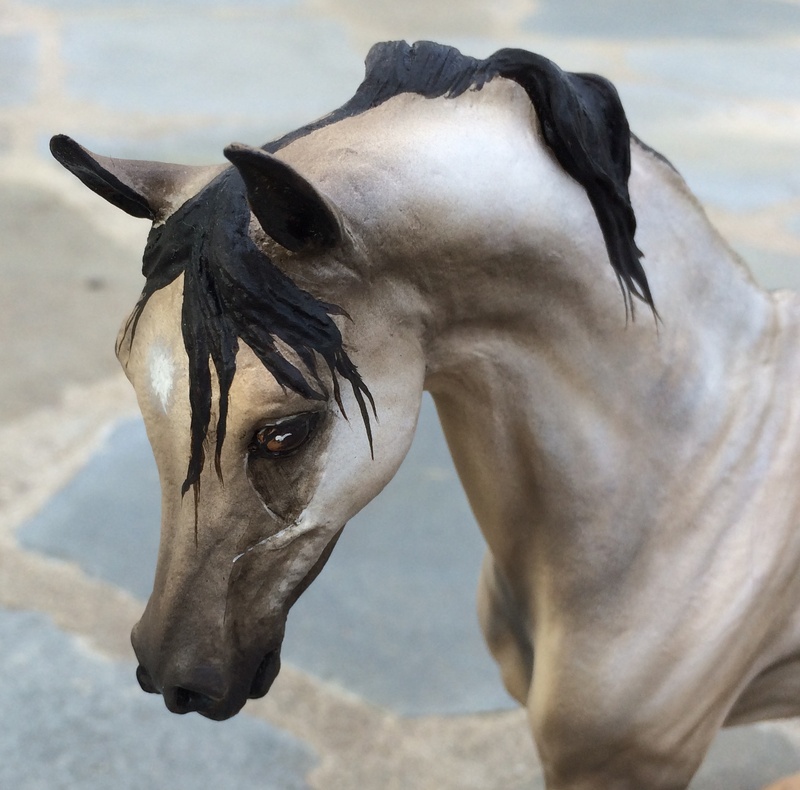 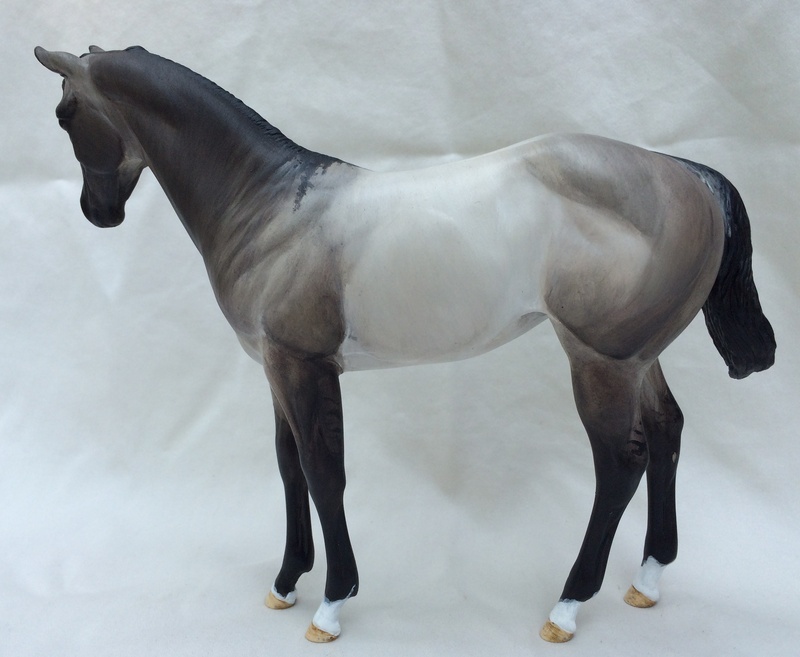 She was painted by Kate Schick of Tuscany Studios to a rose grey with black points - I wanted her to match my Bogucki Aashiq who is painted a dark dapple grey by Sheri Rhodes (and is also now for sale). 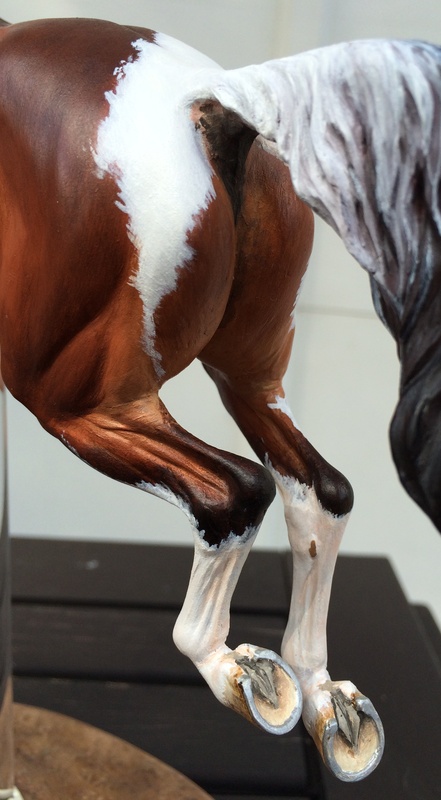 Kate Schick has always been one of my favorite painters, because of the soft shading, subtle color blending, and attention to detail. 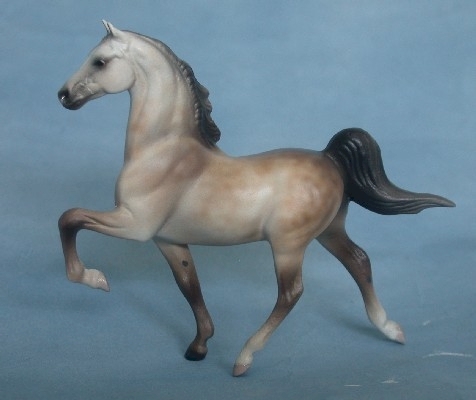 But she is pricey and I don't have many horses painted by her. 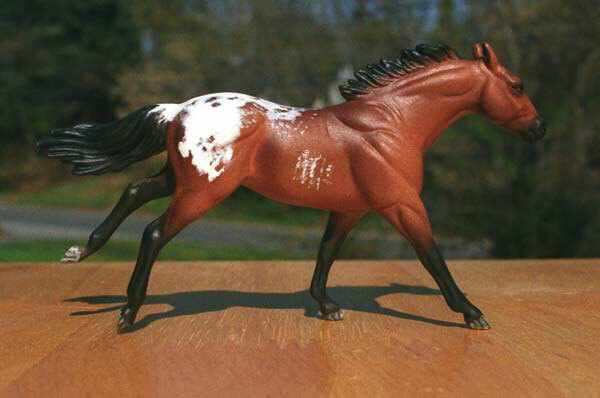 The pictures of Johara taken in full sun rather wash out her coloring along the barrel a bit. 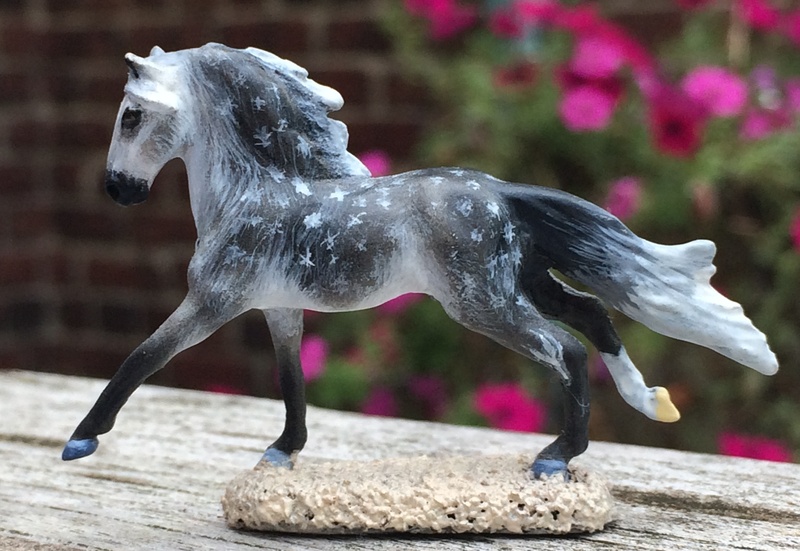 In the shade pictures you can see the delicate dappling better, and I included the closeup shot just for this. 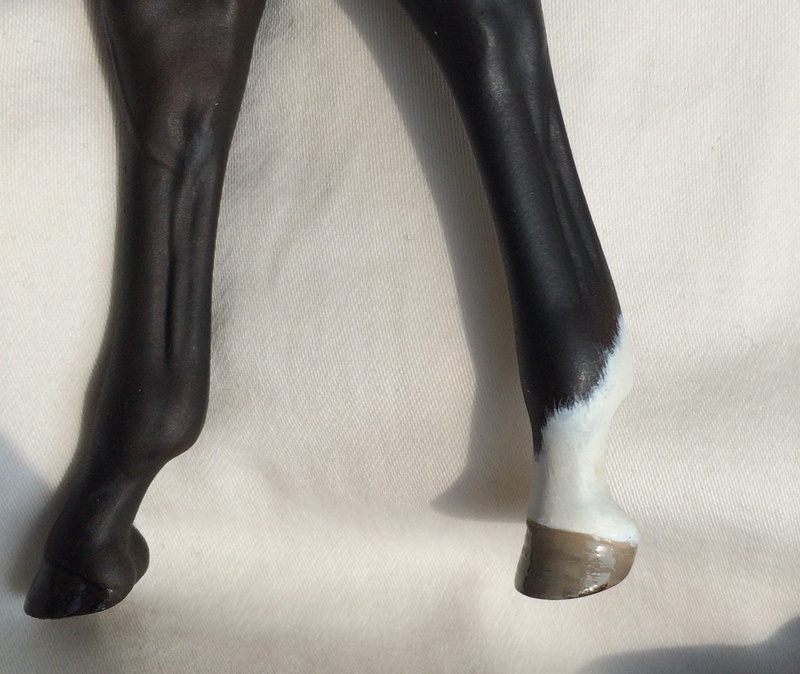 However, in the shade picture of her full left side, I think she looks a bit darker than she actually is. 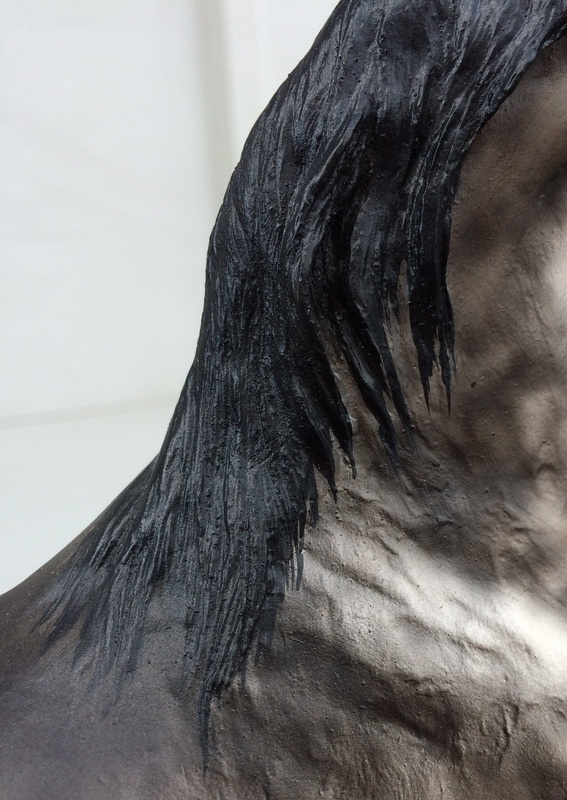 I really like what Kate Schick did with the mane and forelock, streaming little wisps of hair onto her neck! 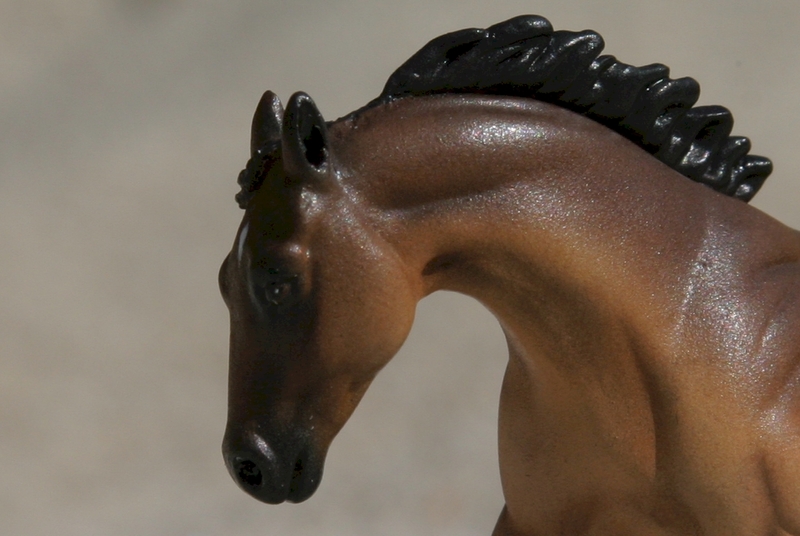 The right side headshot photo probably shows this the best. 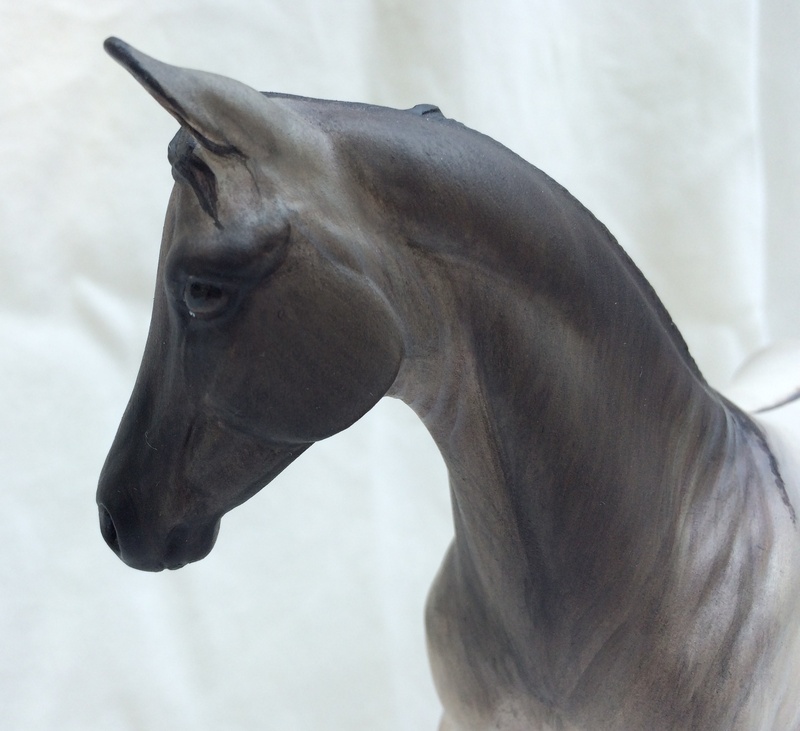 I named her "Entreaty" but have never shown her... of course she could be called anything. 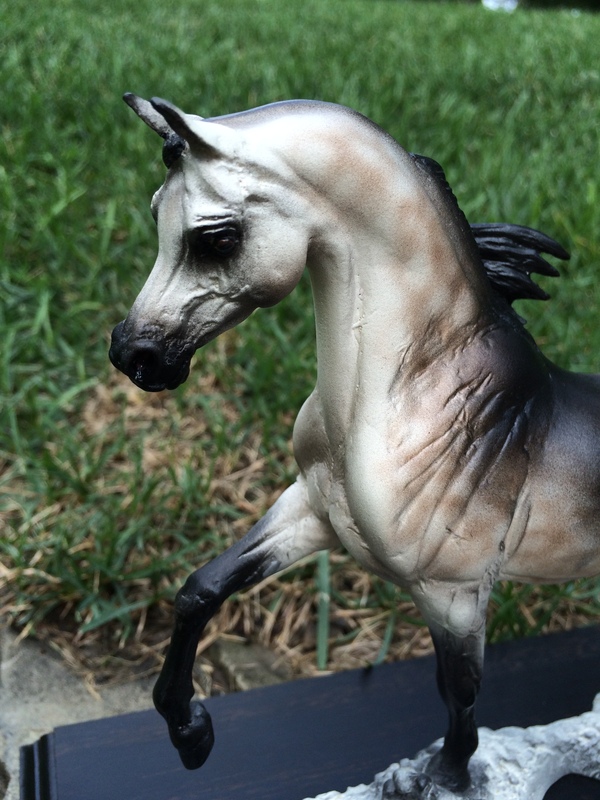 I paid $227 for the body/ shipping, $25 for prepping, and $320 for the paintjob/ return shipping. 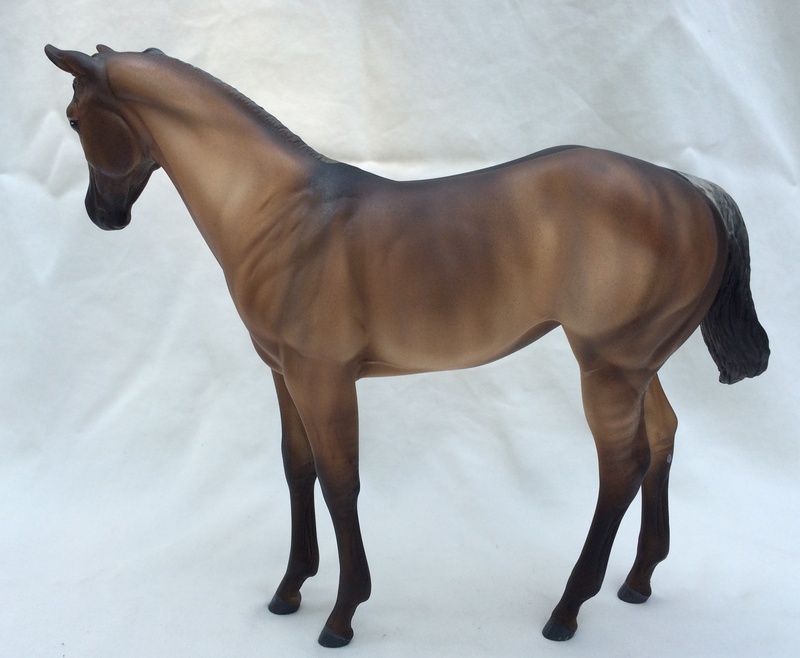 $572 invested in her, and she came out beautifully... was not even on my list to sell at first. 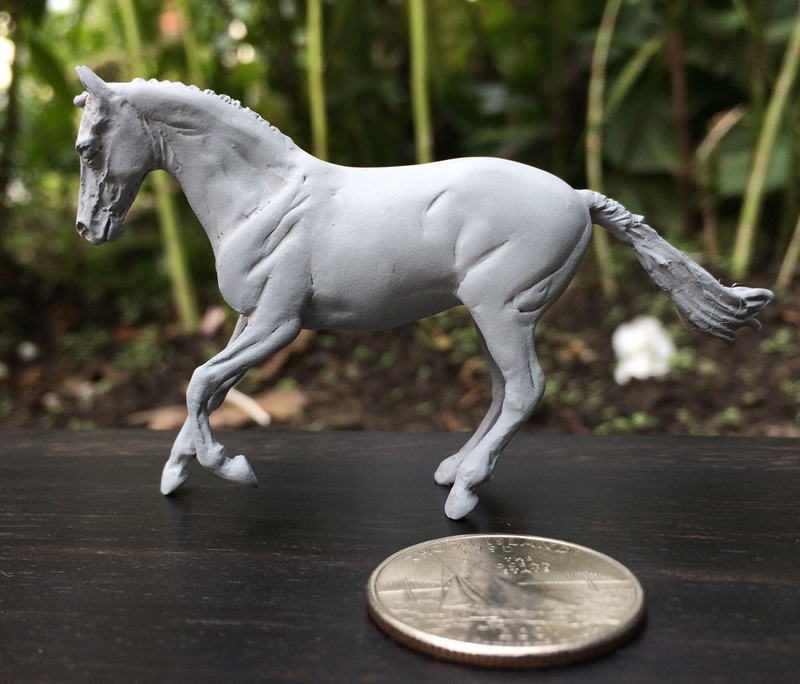 If you're interested, let me know what you're thinking price-wise and hopefully we can work something out. 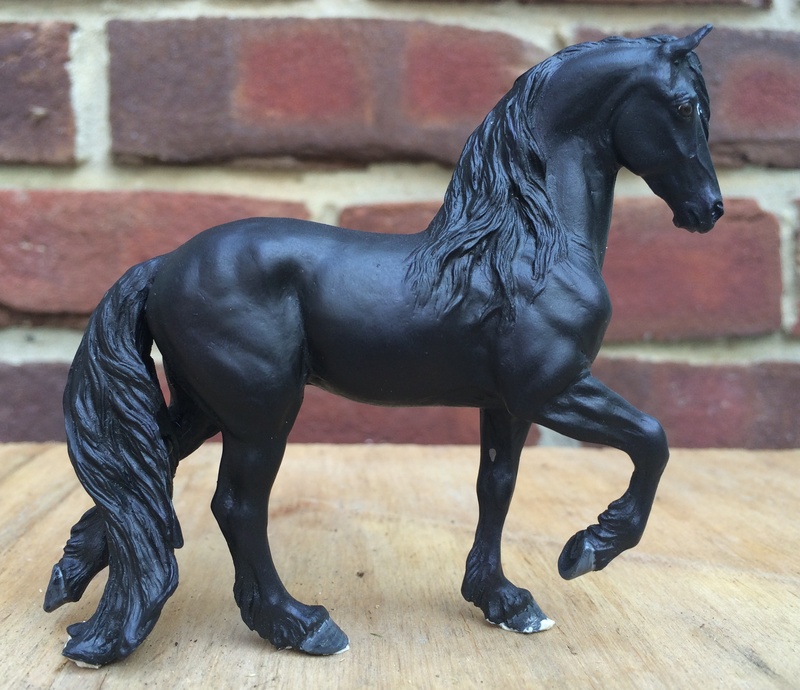 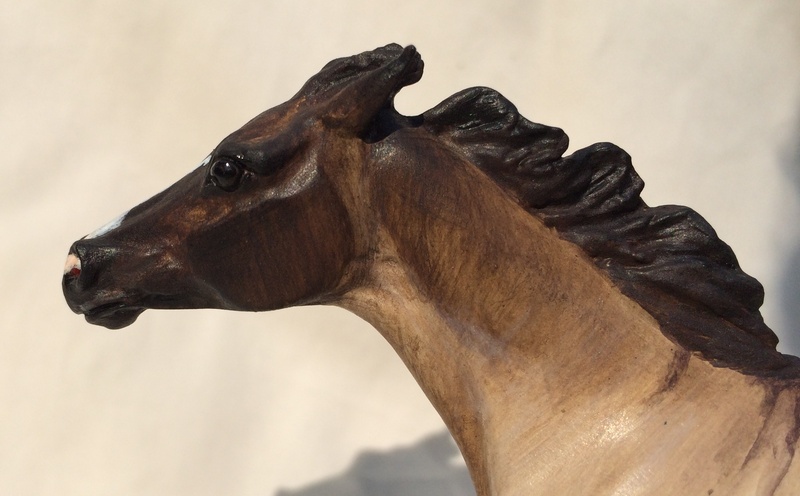 Accompanied by solid EBONY wood stand - two holes in the horse's base and two pegs in the stand keep it from tipping. 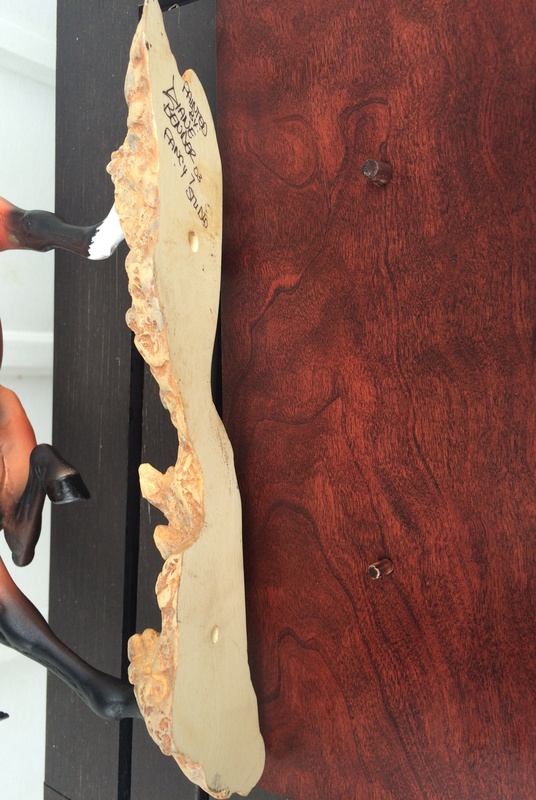 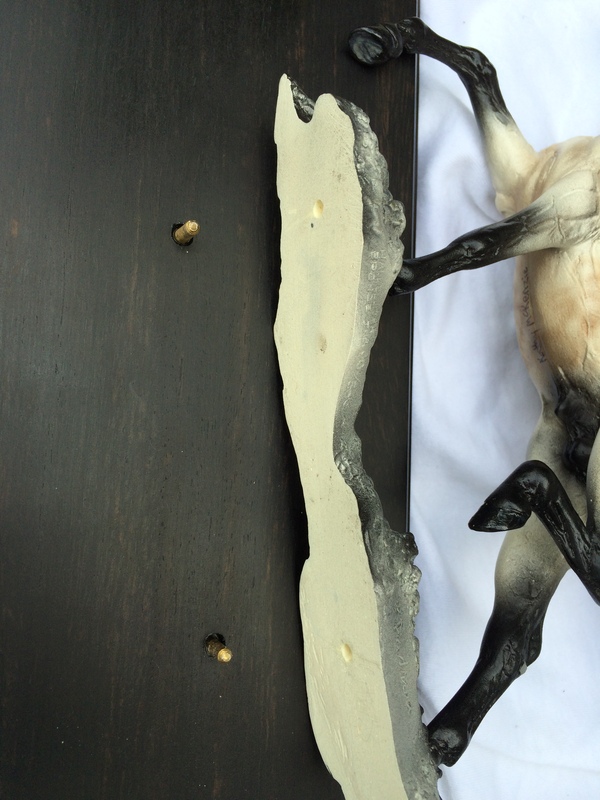 Solid cherry wooden STAND for traditional scale *Padron, sculpted by Vicki Keeling. 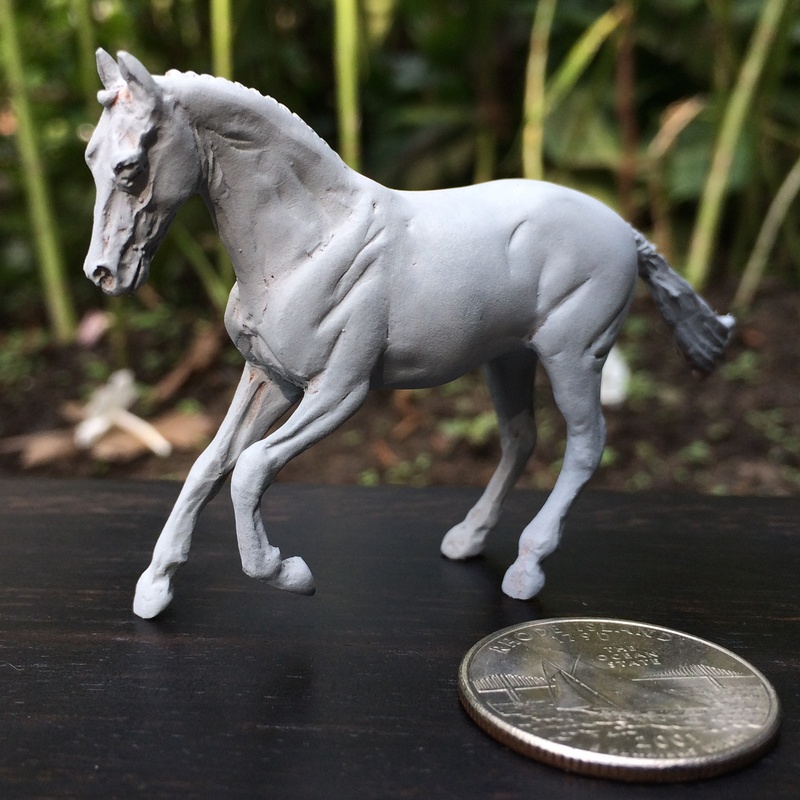 This sculpt is a bit topheavy, but two holes in the horse's base and two pegs in the stand keep it securely from tipping. 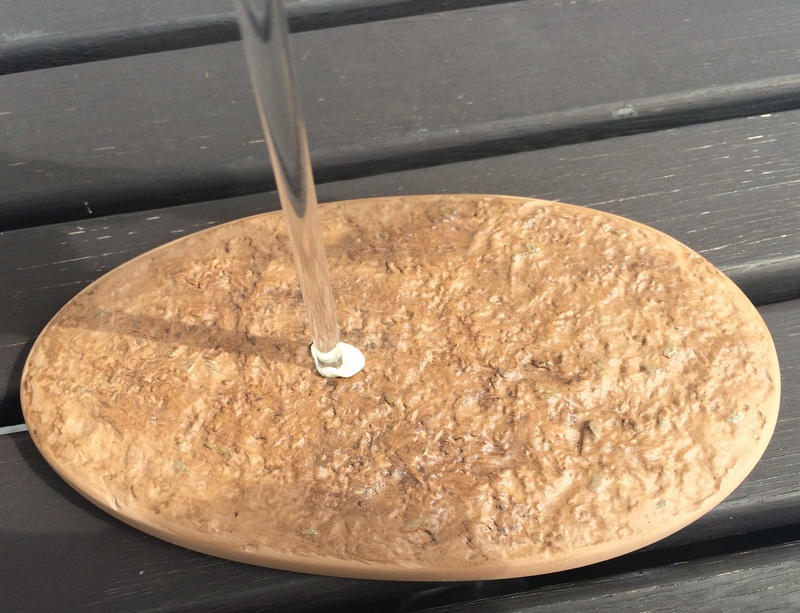 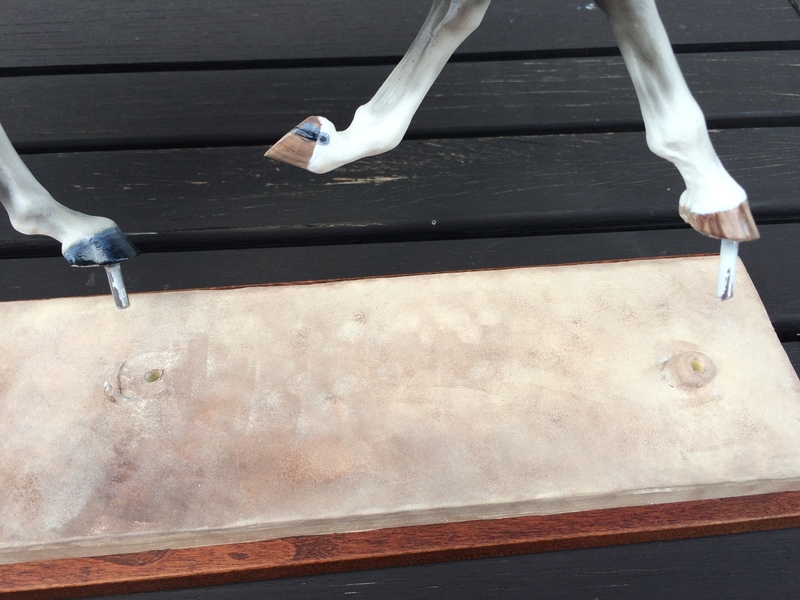 Stand only available; you will need to put the holes in your own horse's base in order to use it. 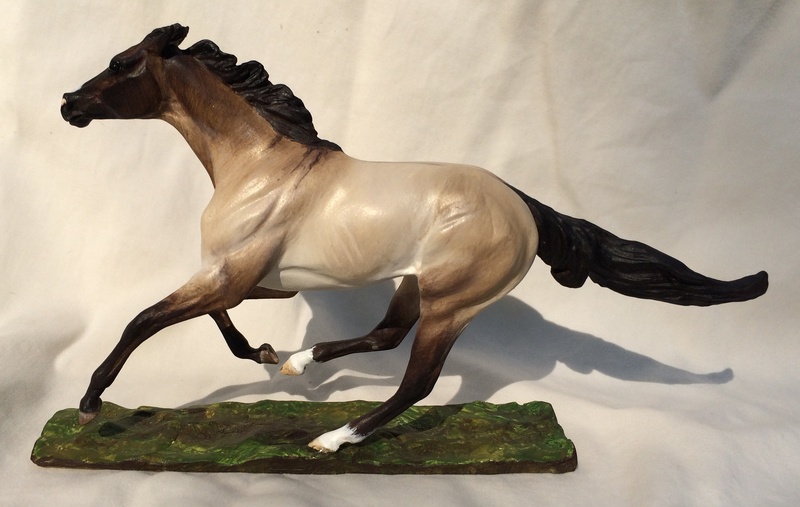 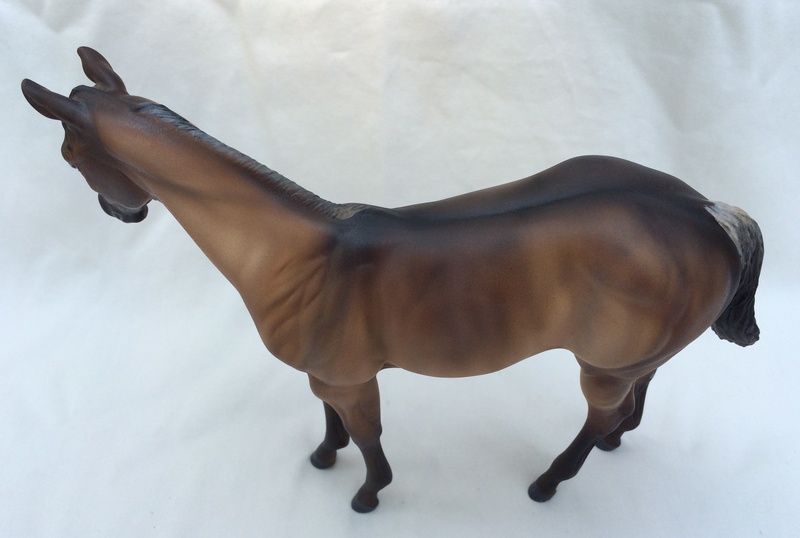 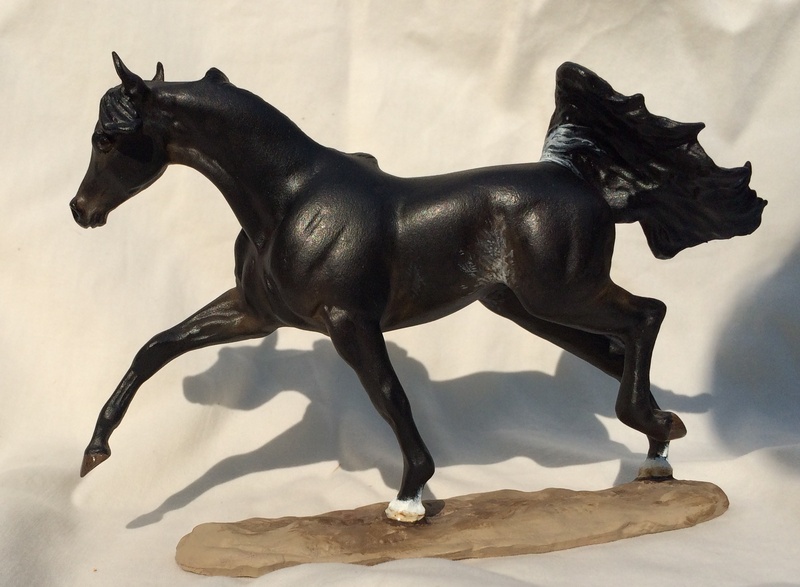 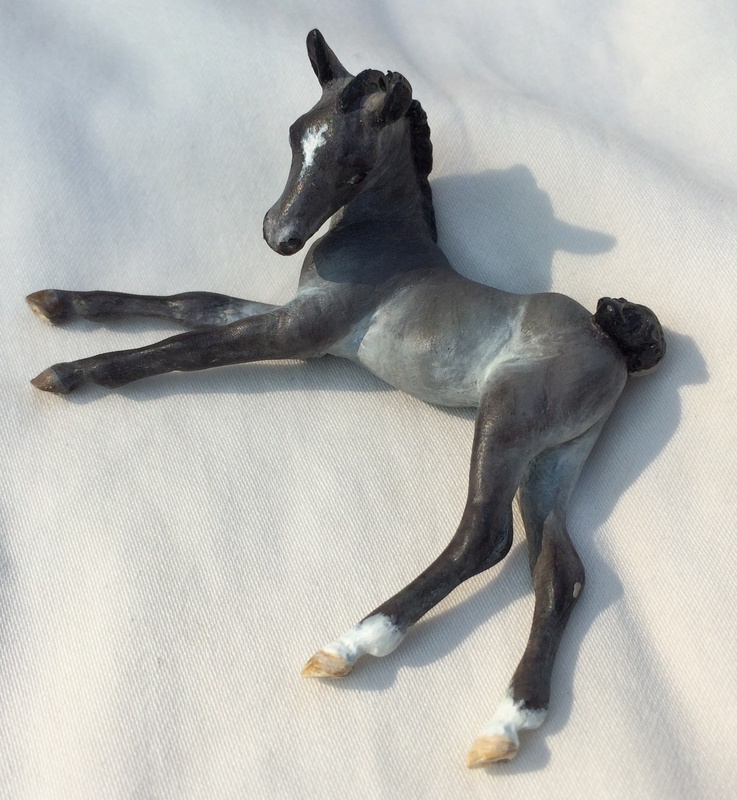 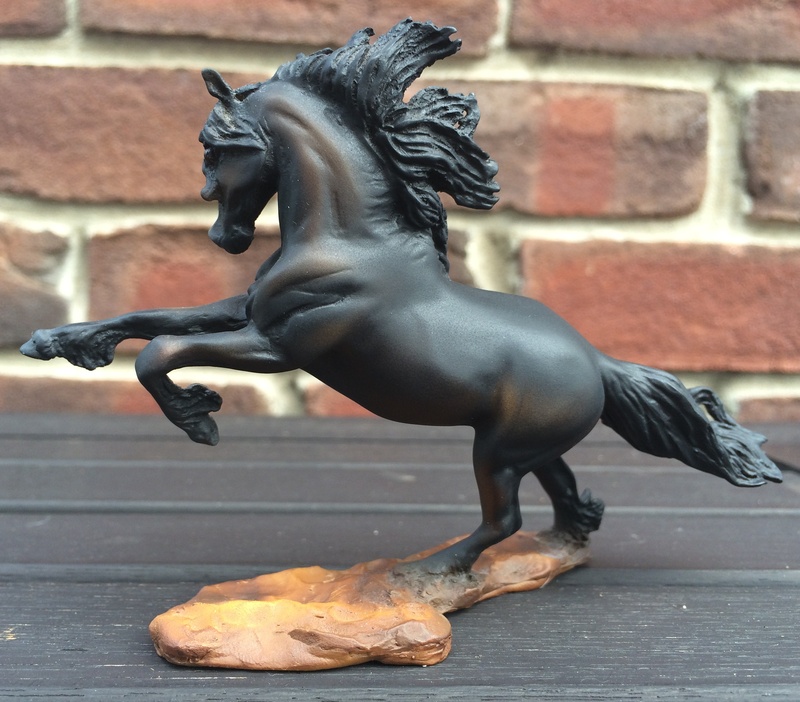 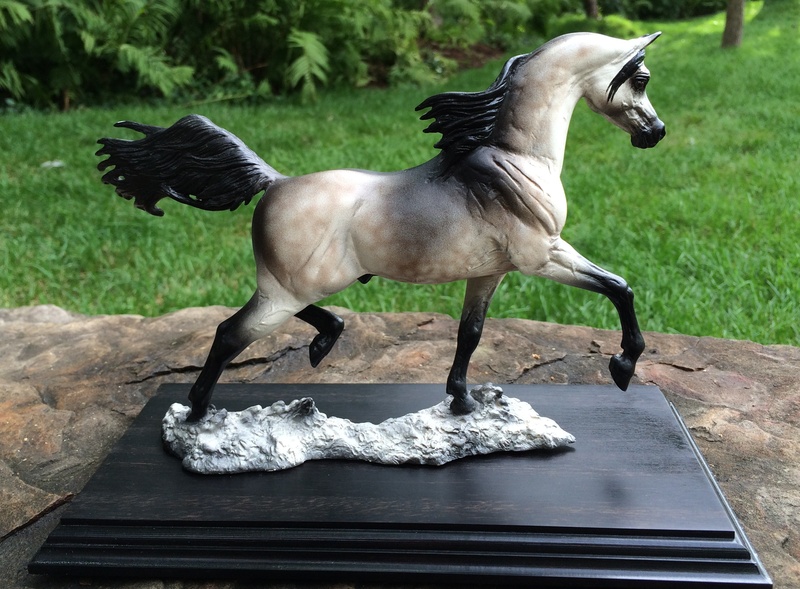 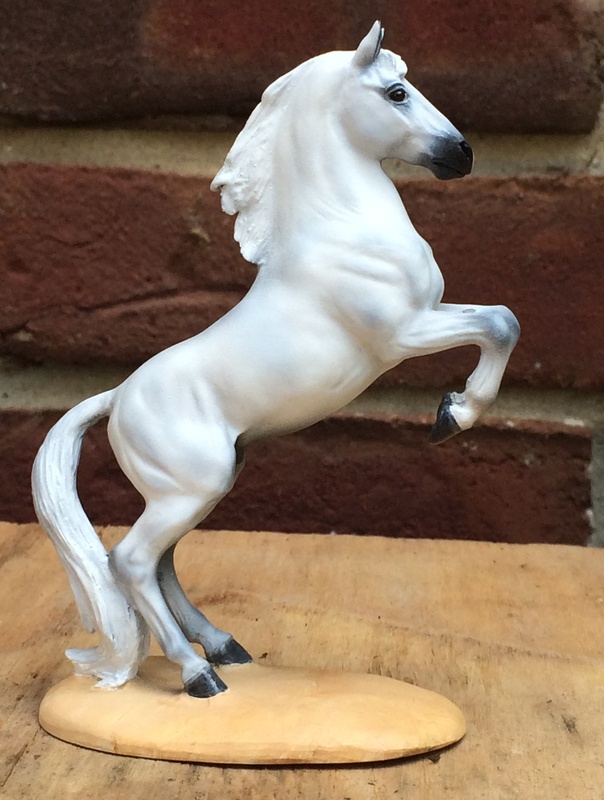 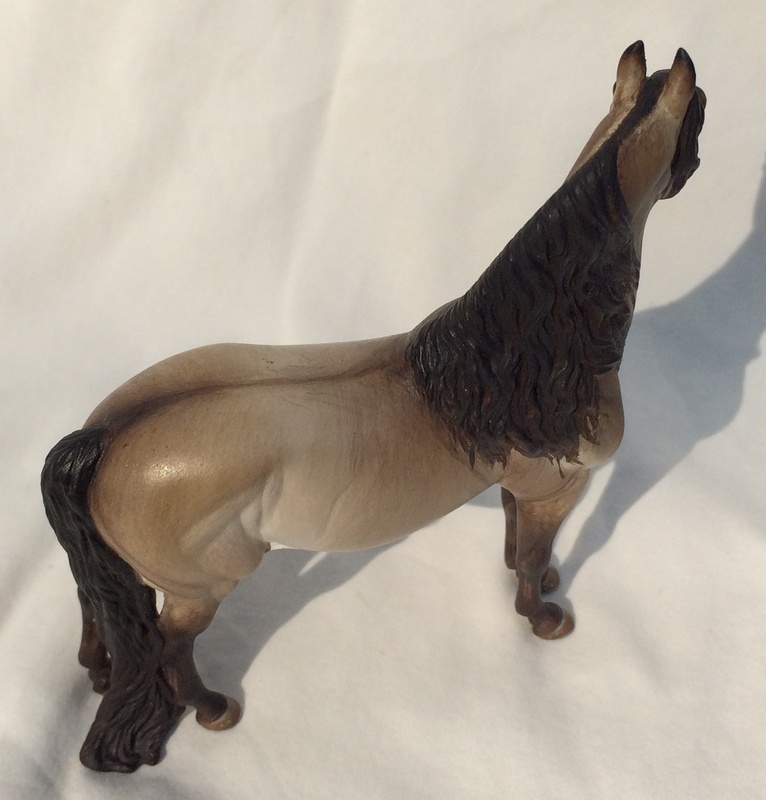 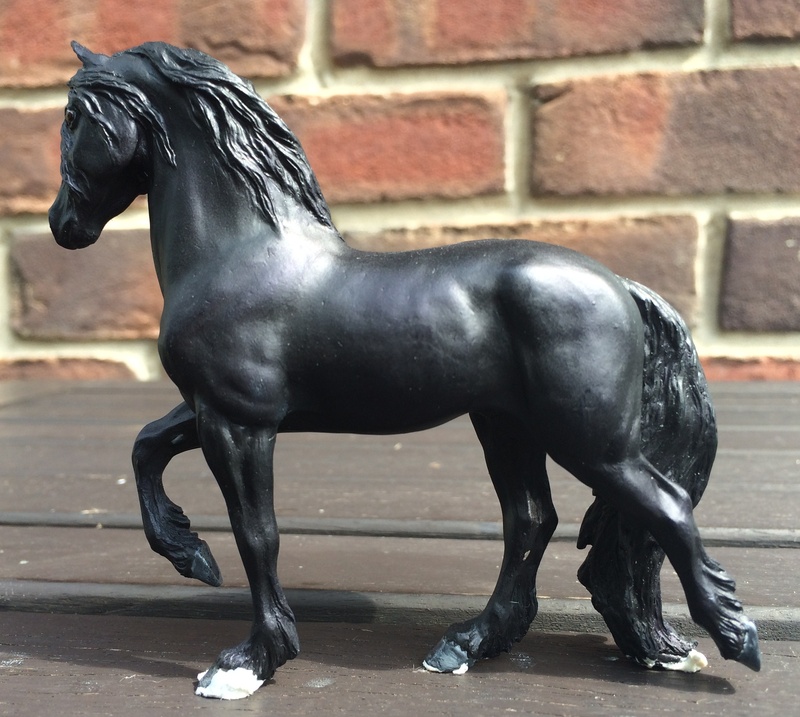 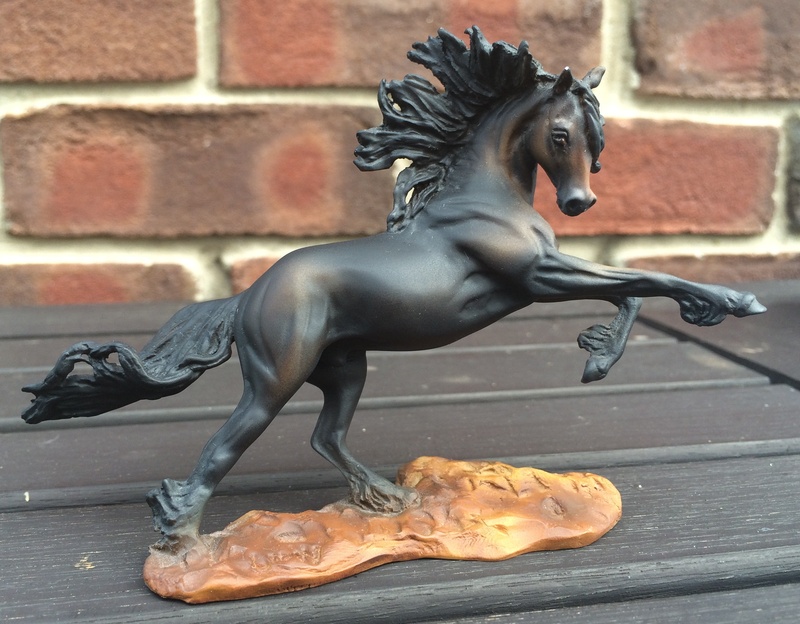 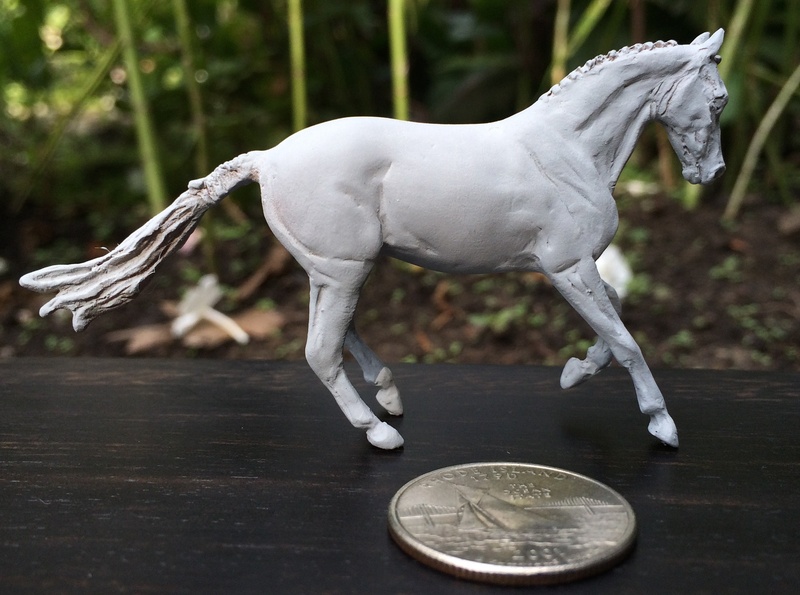 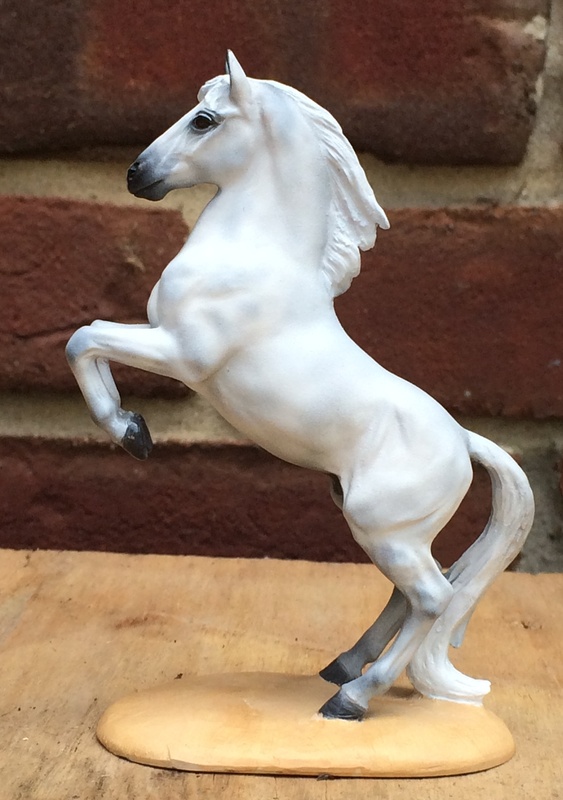 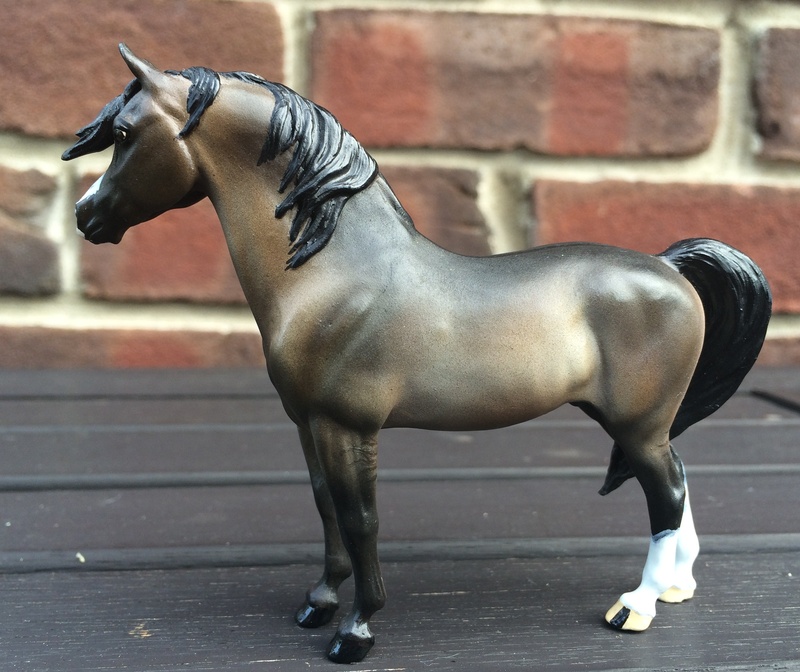 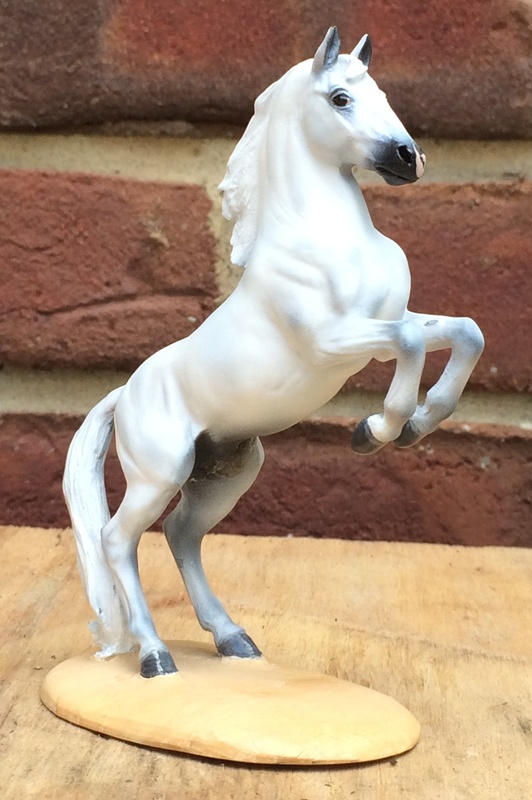 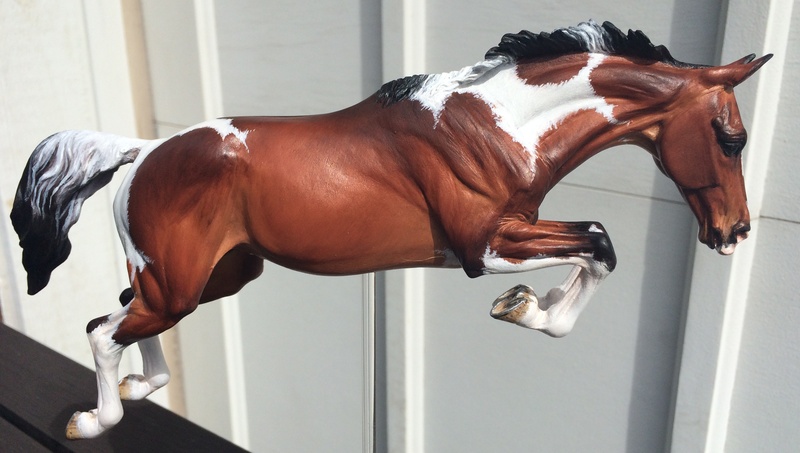 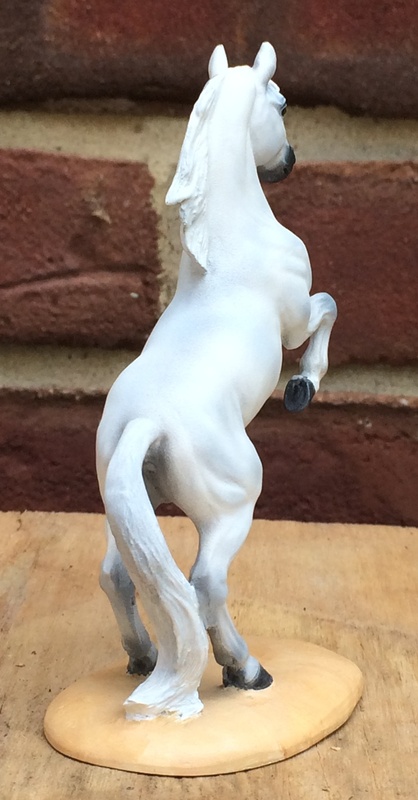 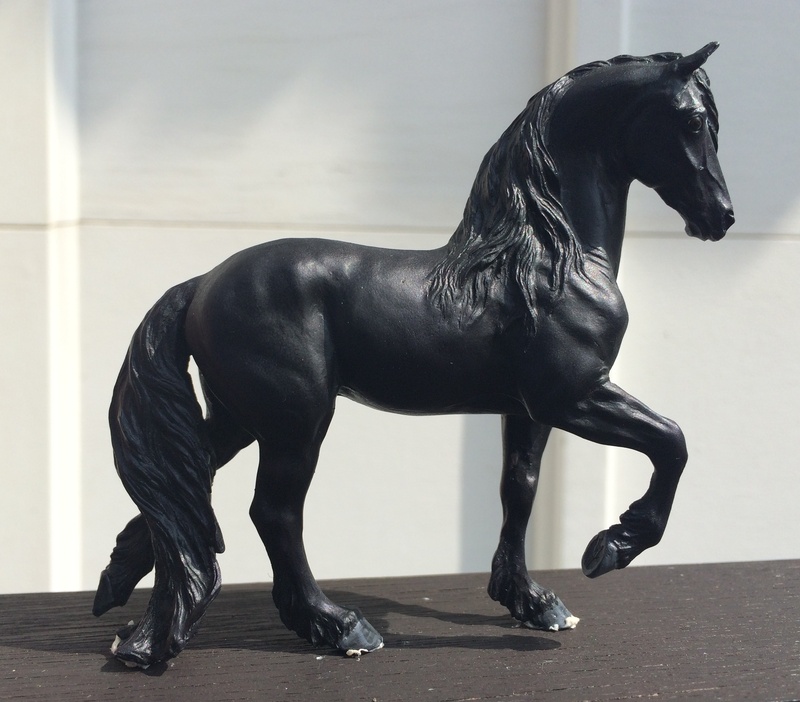 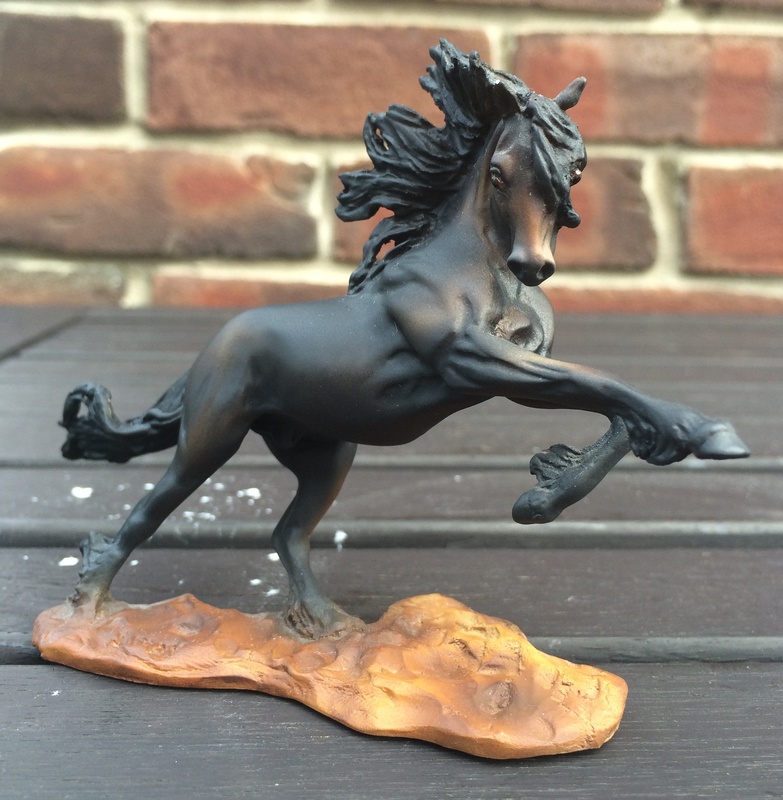 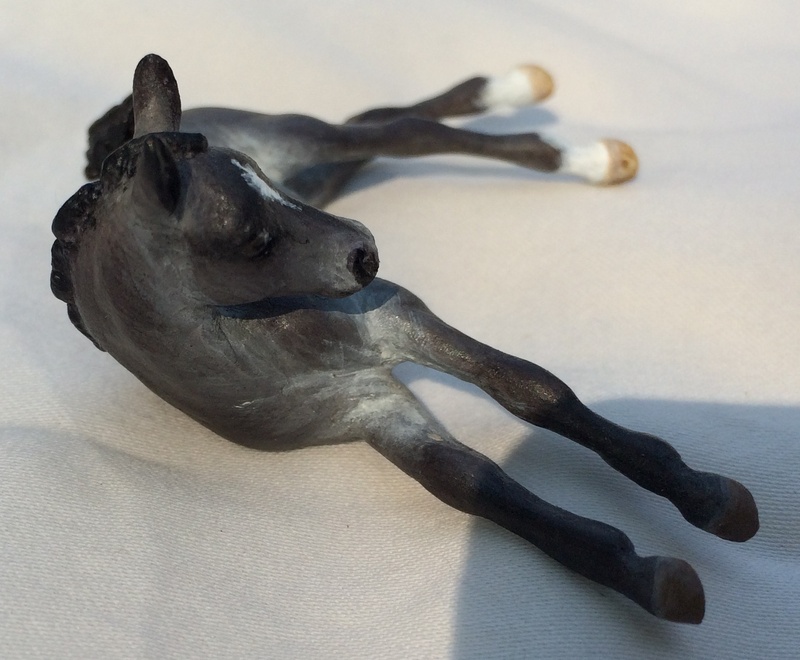 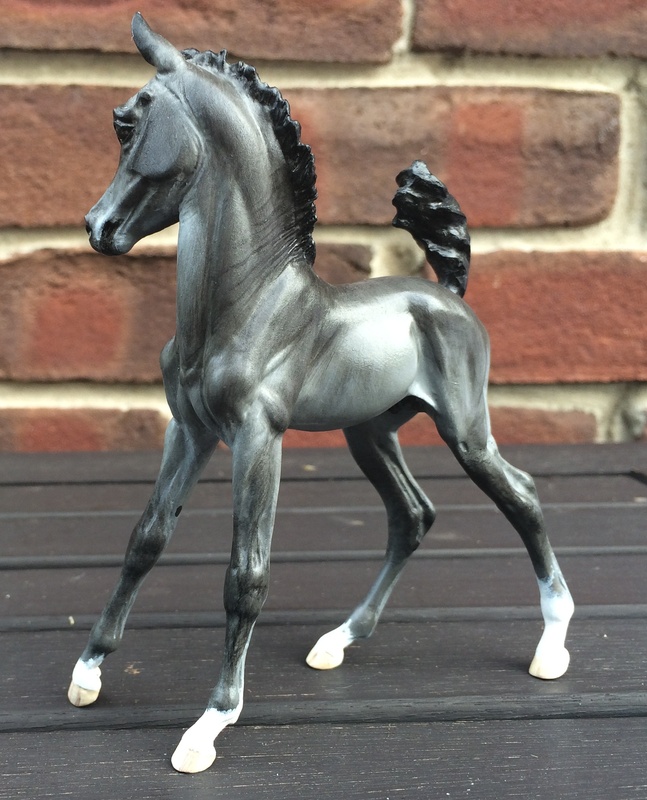 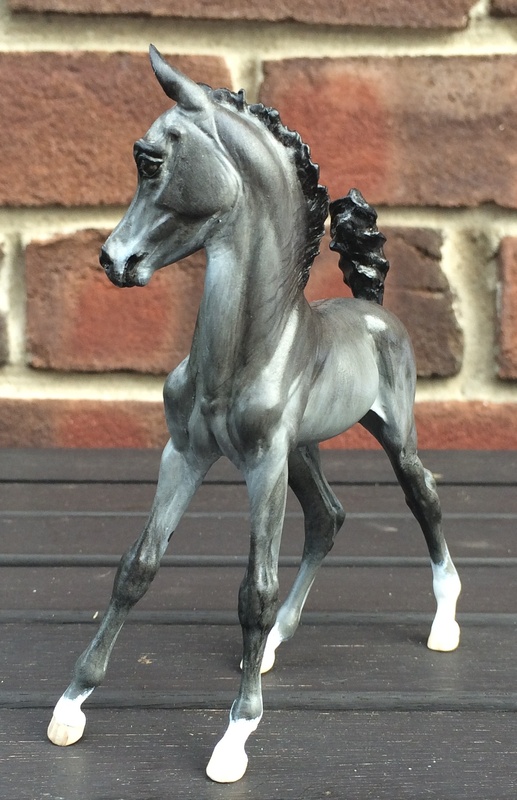 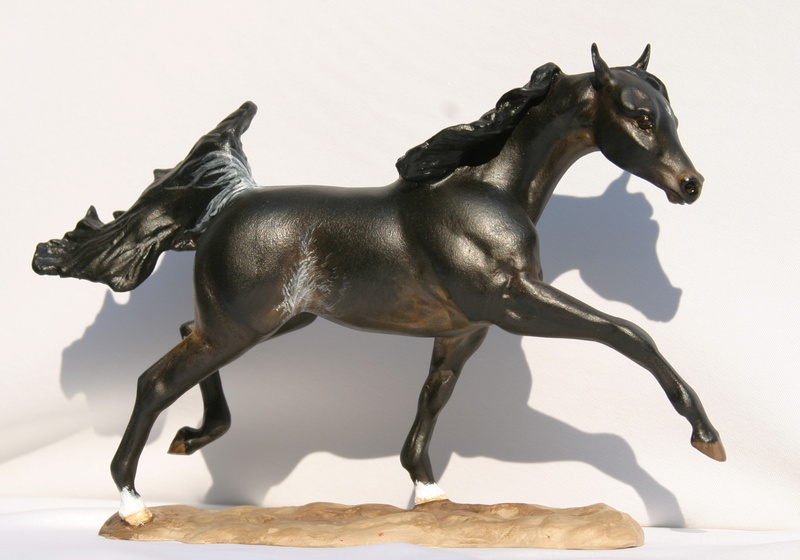 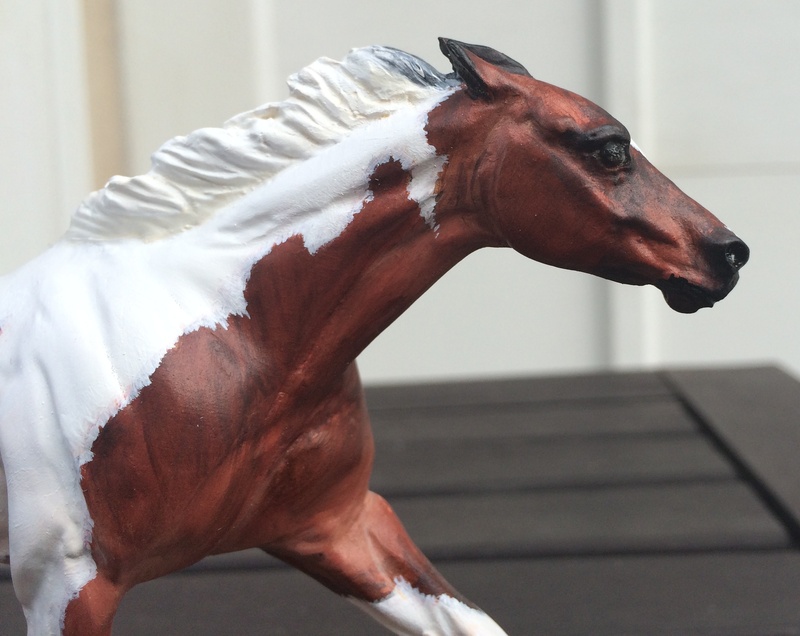 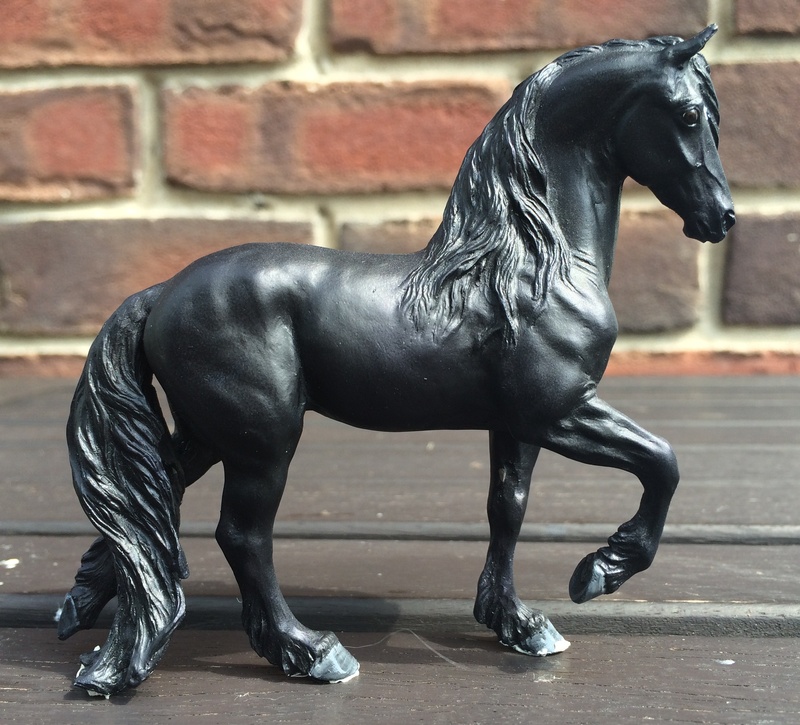 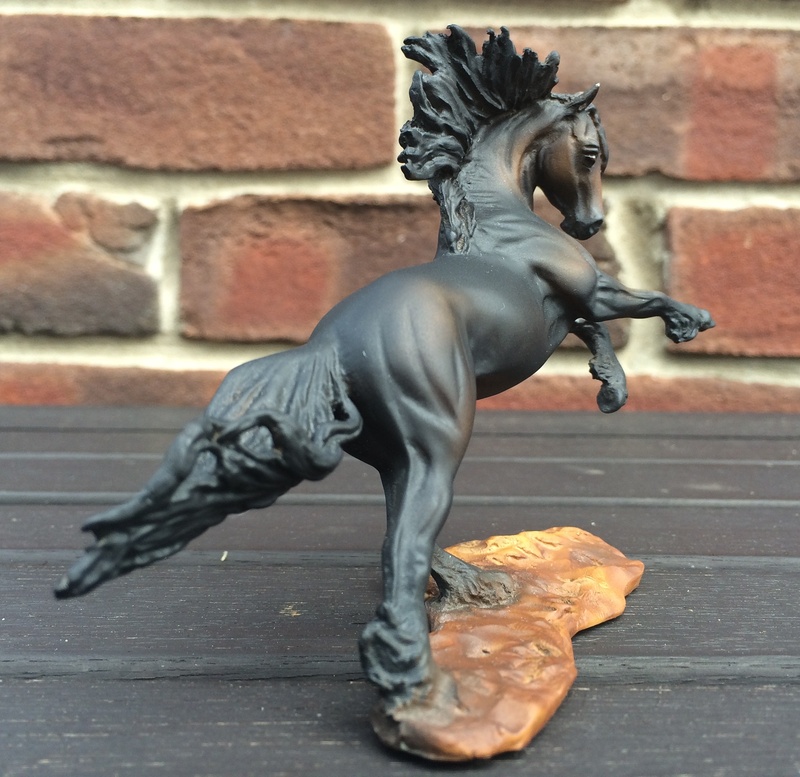 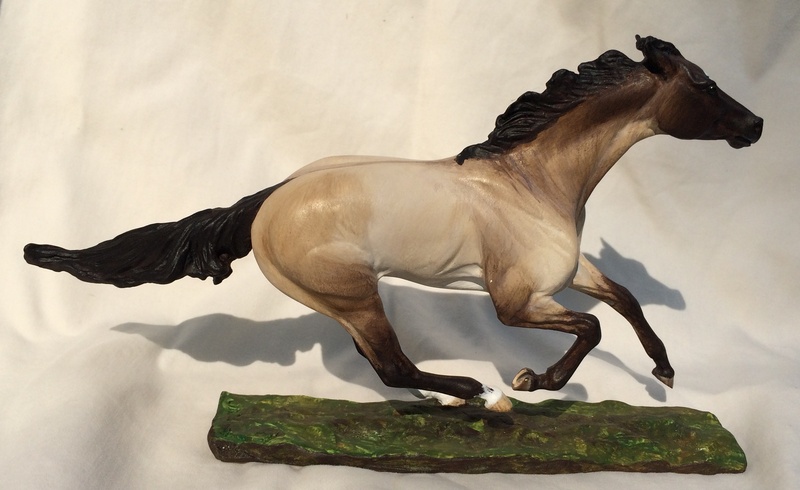 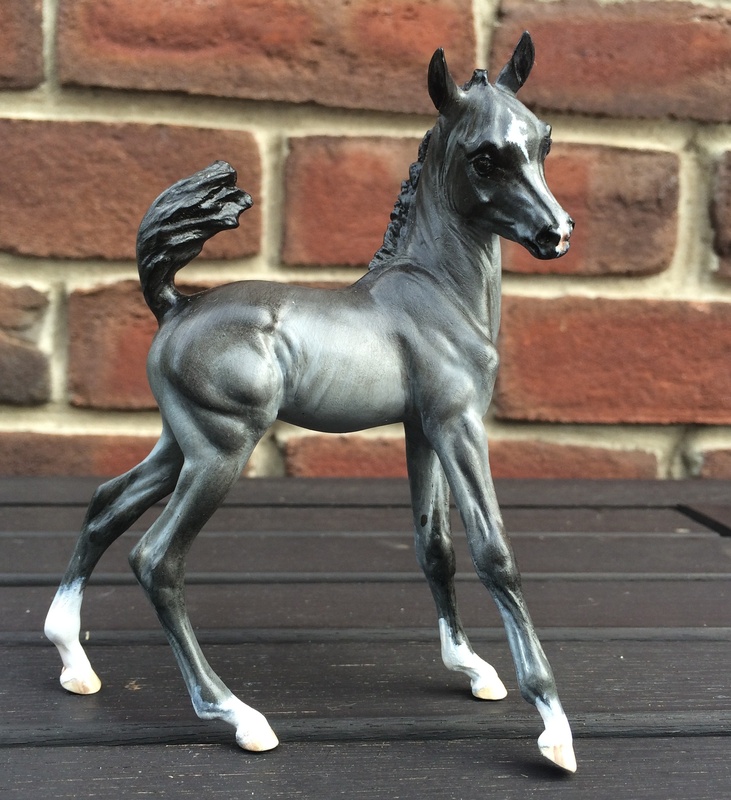 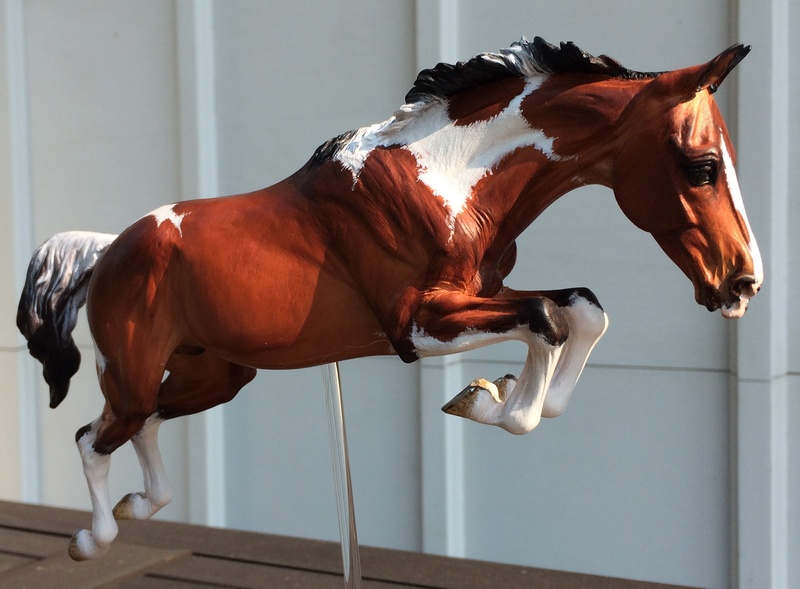 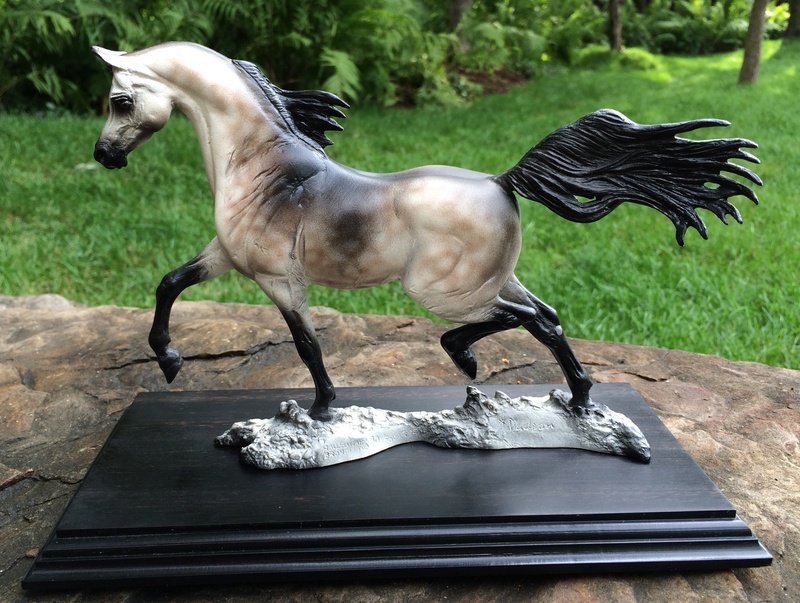 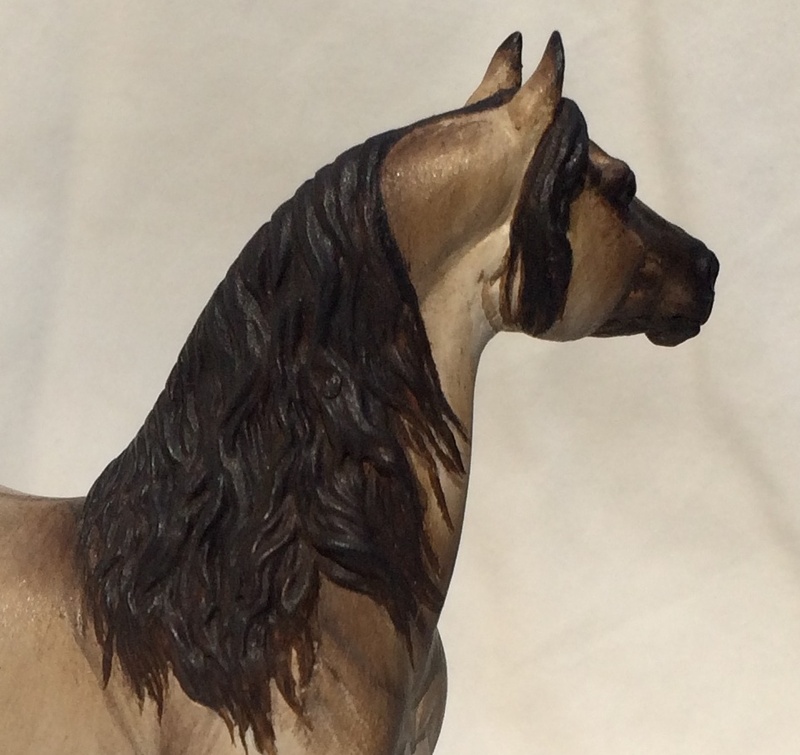 Souvenir, tiny mare sculpted by Linda York, unpainted. 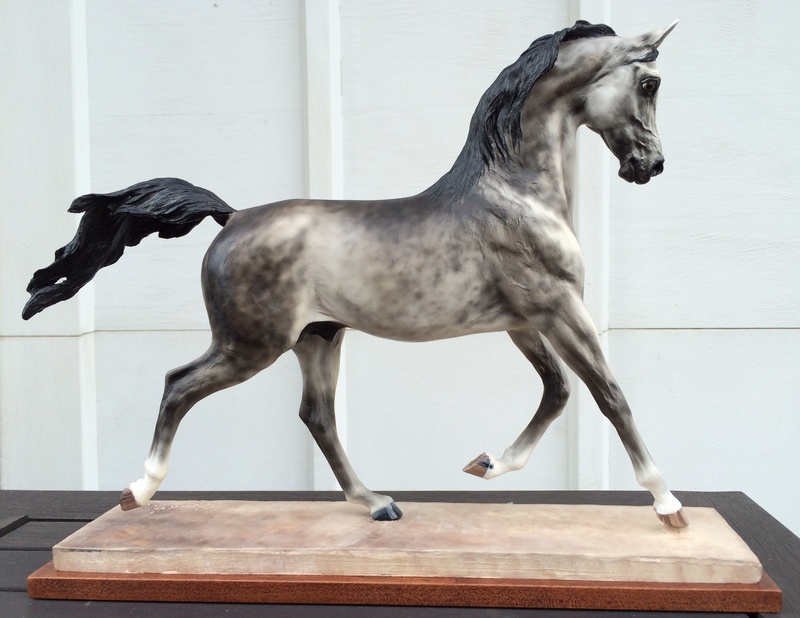 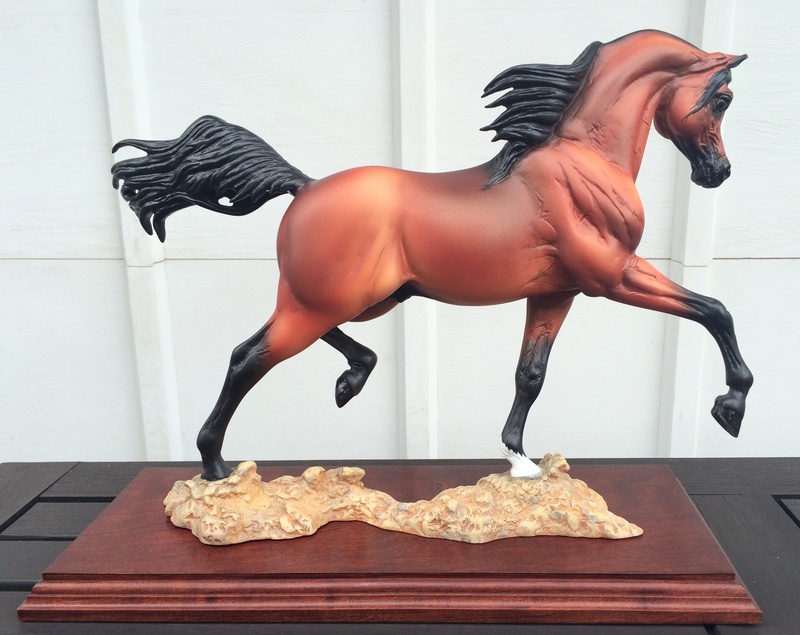 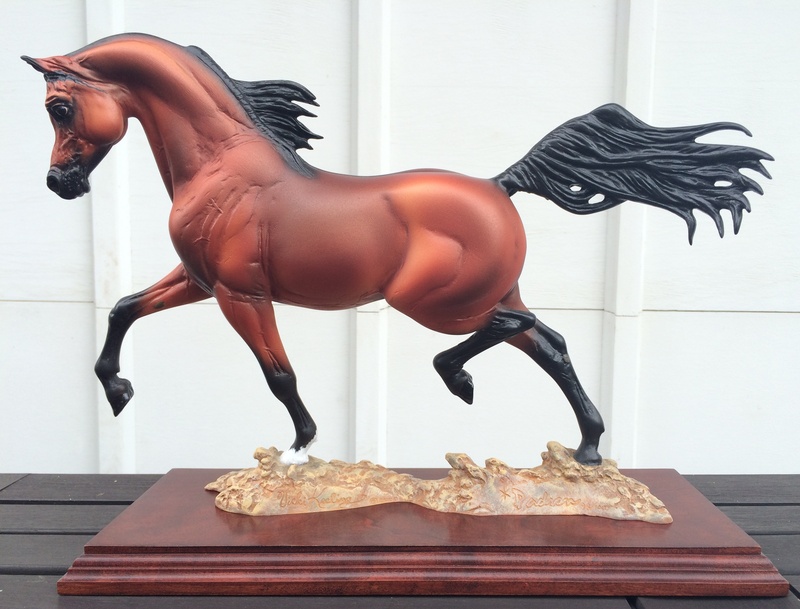 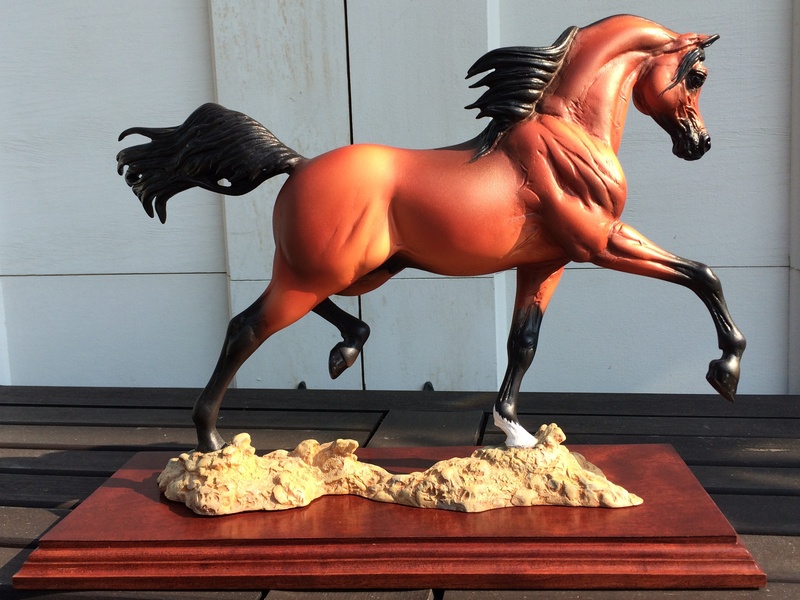 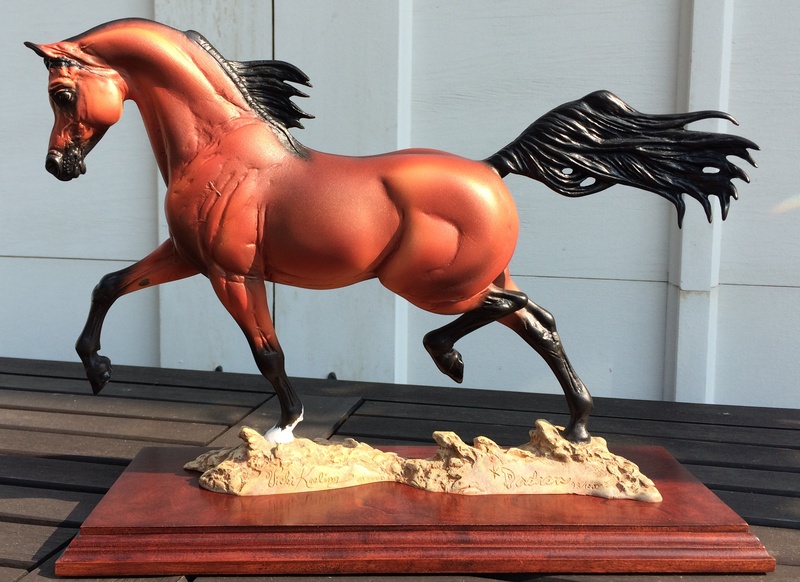 Covenant Renewed, Morgan stallion sculpted by Chris Jolly and Stacey Tumlinson. 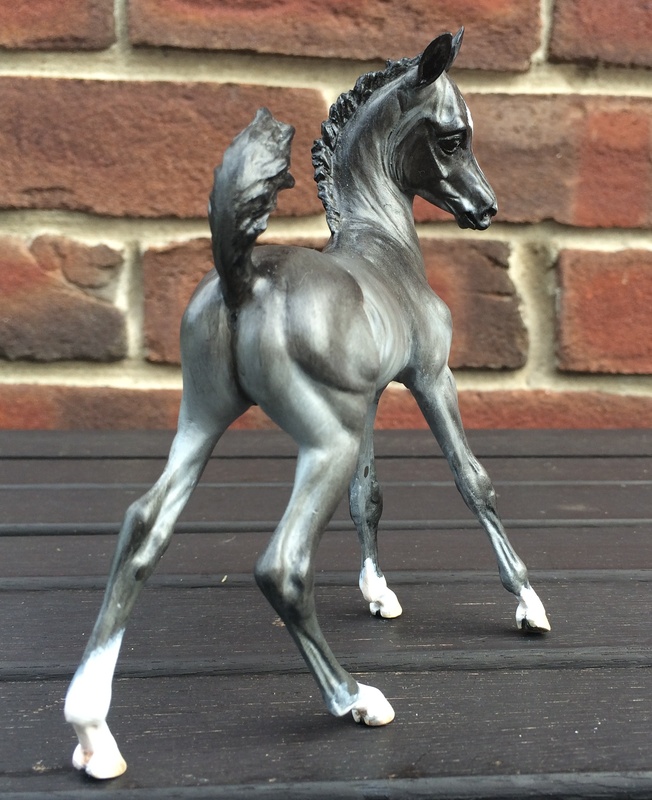 This is the mini version of Chris Jolly's famous Morgan WBP Covenant Kept.